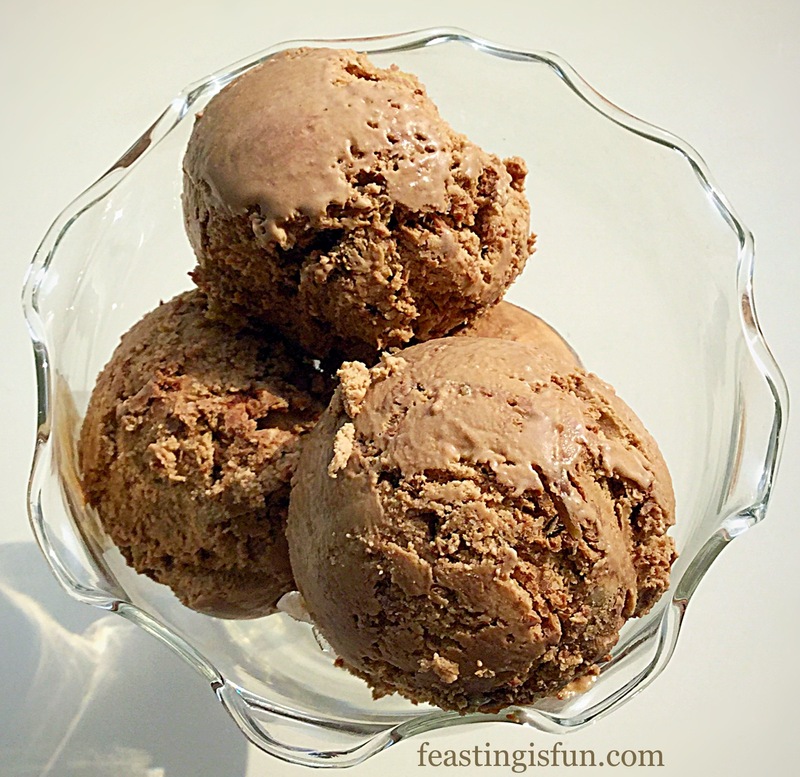 With Father’s Day coming up this Sunday, here is an easy to make and decorate treat for Dad. 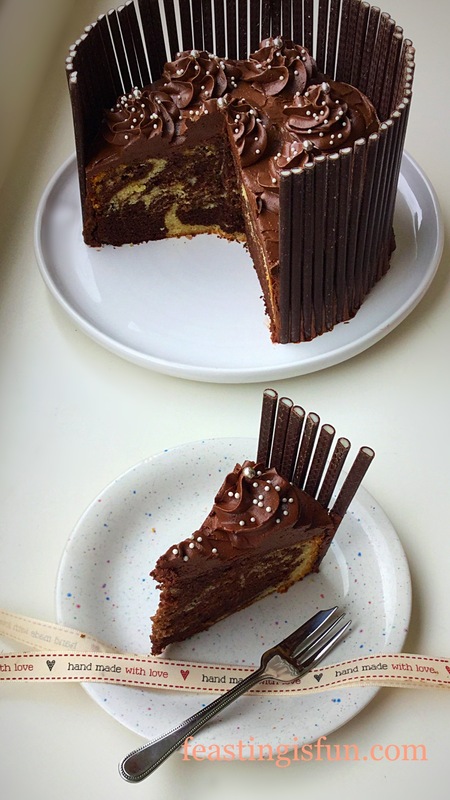 Lemon and chocolate intertwined within every part of this stunning Fluted Chocolate Lemon Marble Cake. 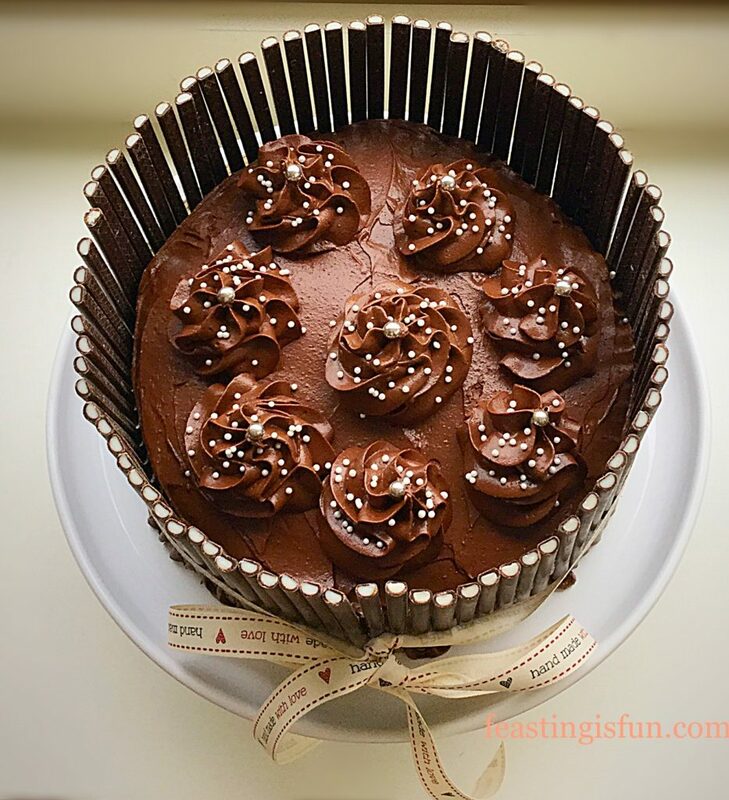 Fluted Chocolate Marble Cake perfect for any celebration. You can make this cake for Father’s Day, or as a special celebration cake. 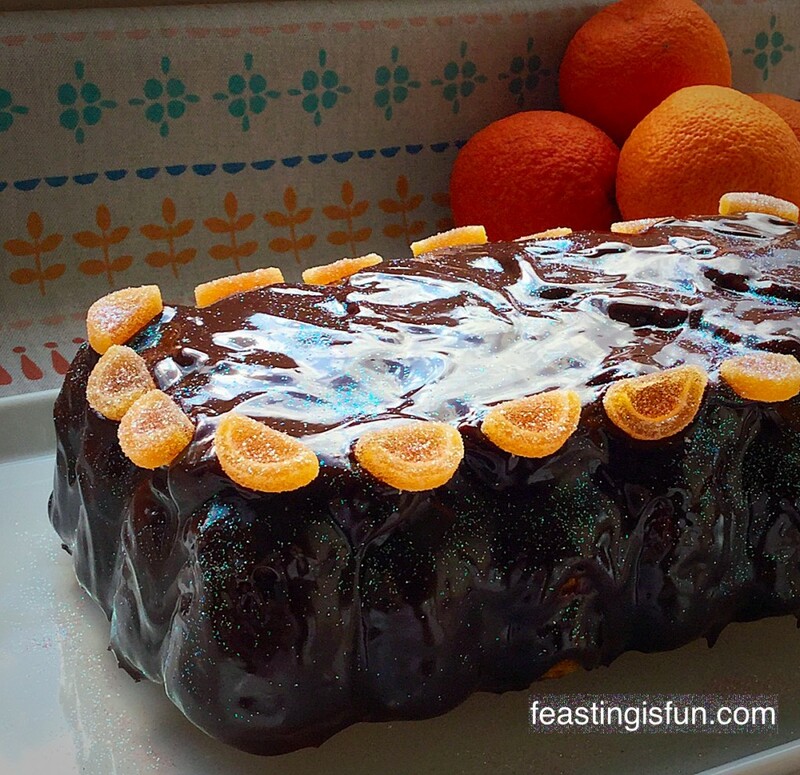 Since the blend of chocolate and lemon throughout every part of this cake is a taste sensation. 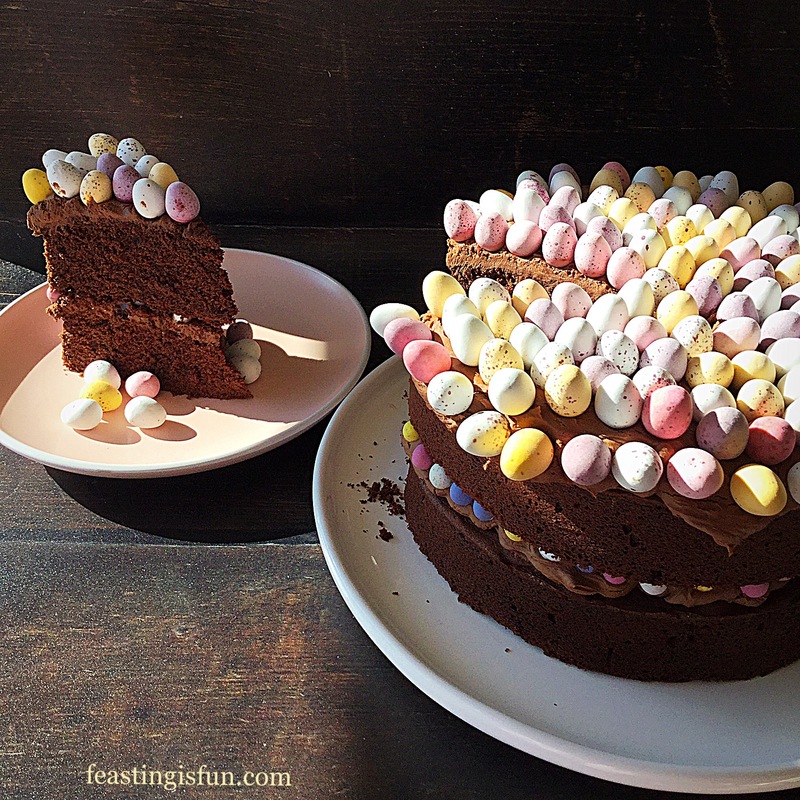 If you have never tried the two together then you need to trust me and make this cake. 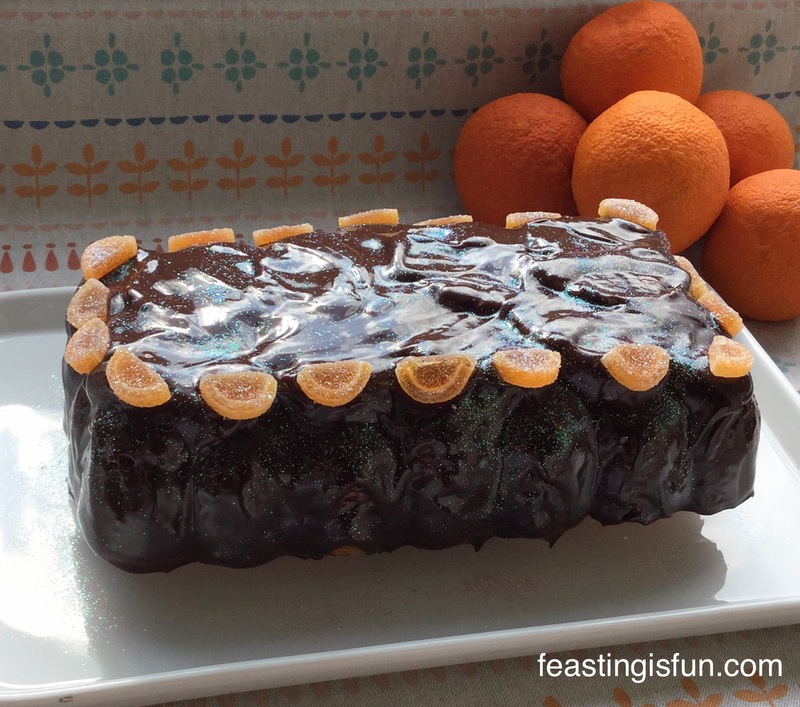 Fluted Chocolate Lemon Marble Cake whoever receives this will be thrilled. 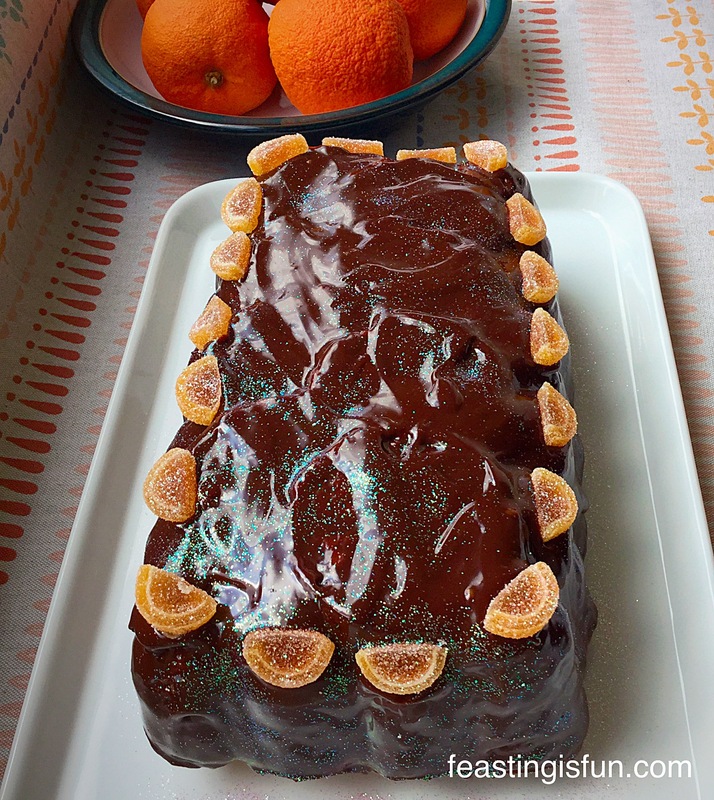 Whilst orange and chocolate is a more common flavour pairing, I was inspired to make this cake when I discovered that Elizabeth Shaw Chocolates made Chocolate a Lemon Flutes. Having used the Amaretto flutes for my Chocolate Amaretto Cake I knew how stunning and yet simple they were to use. 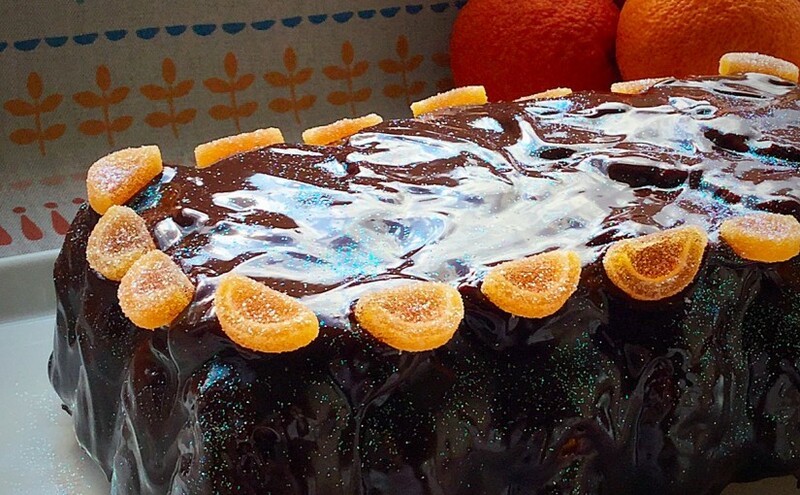 Fluted Chocolate Lemon Marble Cake made with love. 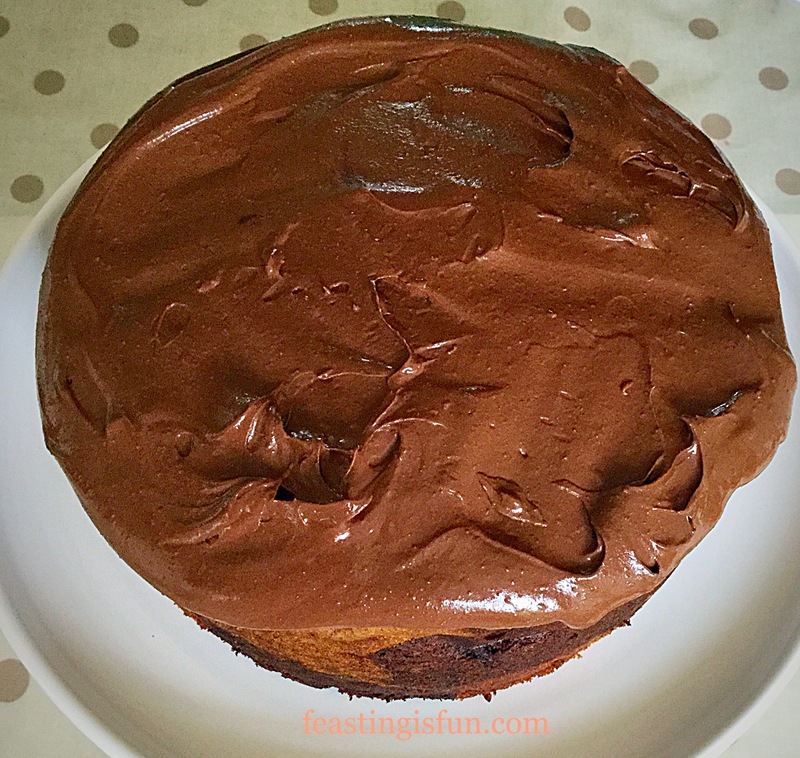 So if you want to make this cake for your Dad this coming Sunday, or a special birthday cake I am right here to show you how to make this stunning Fluted Chocolate Lemon Marble Cake. Nothing is quite as special as something that you have made yourself for someone. Putting the time, energy and love into baking a cake, for me truly shows someone that I love them. Especially if it is centered around their favourite flavours. 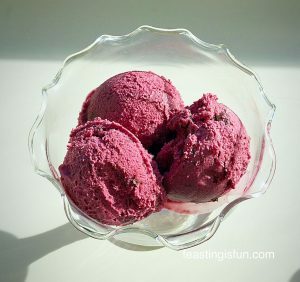 Elizabeth Shaw sell a range of flavoured flutes and you can easily tweak this recipe to fit the flavour of your choice. Adding the flutes around the edge with the extra touch of a beautiful ribbon transforms a nice cake to a wow cake. Fluted Chocolate Lemon Marble Cake plenty for sharing. Grease and line with baking parchment an 8″ or 18cm cake tin – that is also fairly deep – at least 4″/10cm. 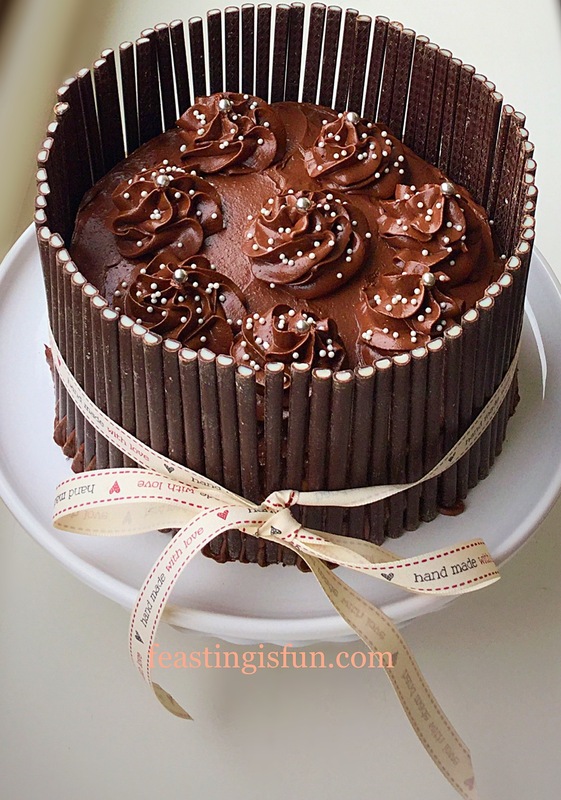 Ensure that the baking parchment is at least 2″/5cm higher than the sides of the cake. 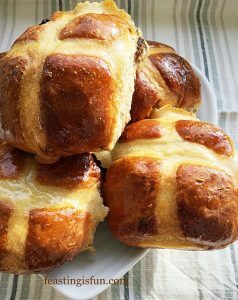 This will ensure a nice even rise and moist cake. In a large bowl add the softened, room temperature butter and caster sugar. 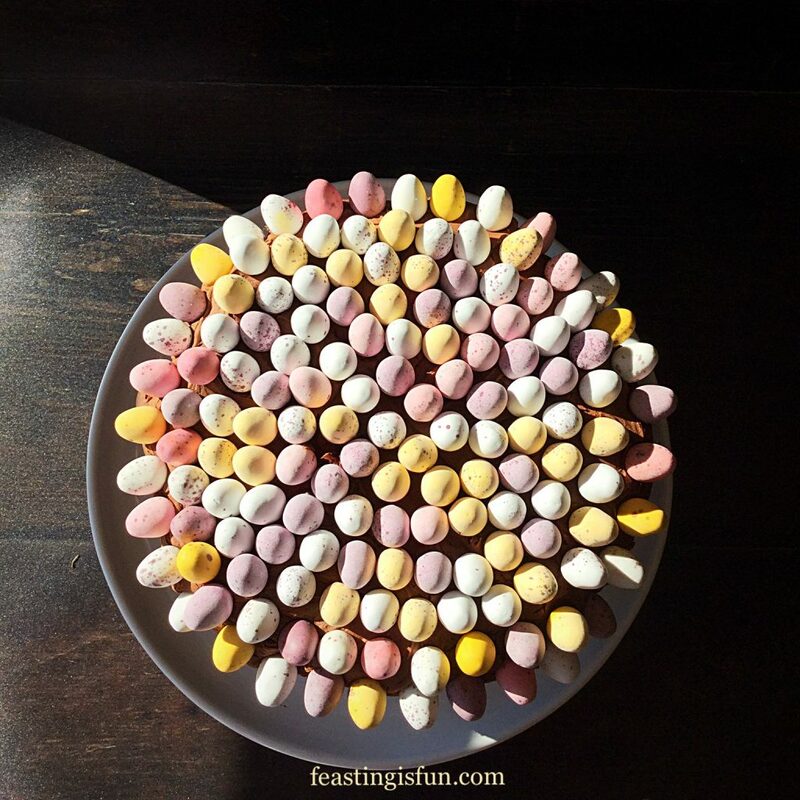 Sift the flour into a medium sized bowl – you will need the bowl later. Add 1/3 of the flour and 2 eggs to the butter mixture, mix slowly until just incorporated. Add the last 2 eggs, remaining flour and the zest of 2 lemons. Use a large spoon or spatula to fold in all of the ingredients until combined – be careful not to overmix. In the spare bowl (which had the flour in it) place half of the lemon flavoured cake mixture – I do this by eye but, use scales if you want to be exact. 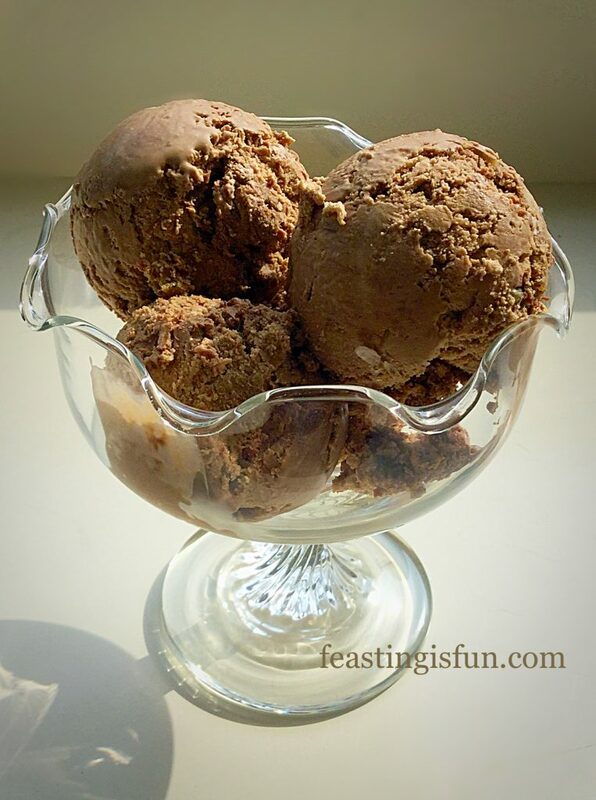 Sift the cocoa into the mixture in the spare bowl and add the 2 tablespoons of milk. 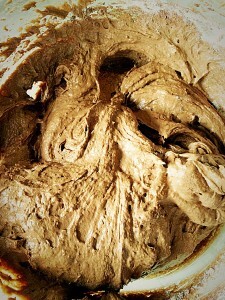 Fold in the cocoa powder until the mixture is combined. 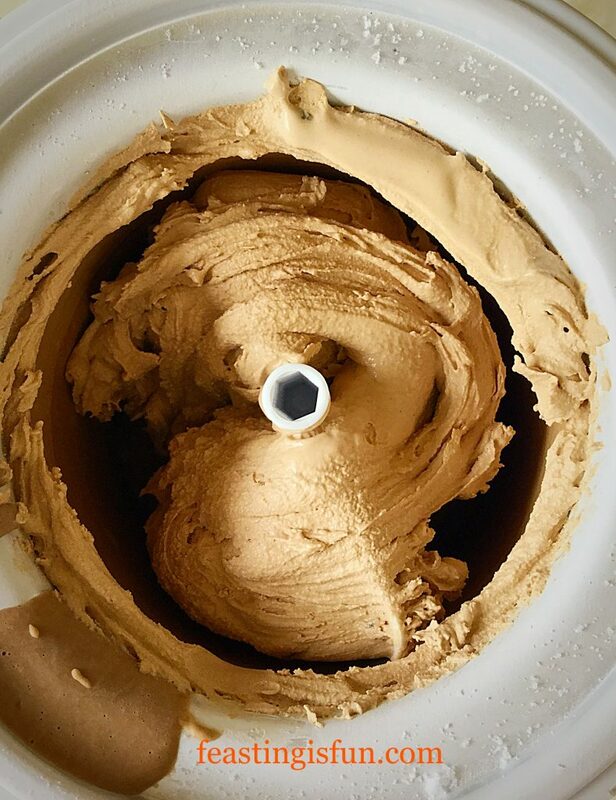 It will be a gorgeous chocolate colour. In the othe bowl squeeze in the juice from half of a lemon. Stir until fully combined. 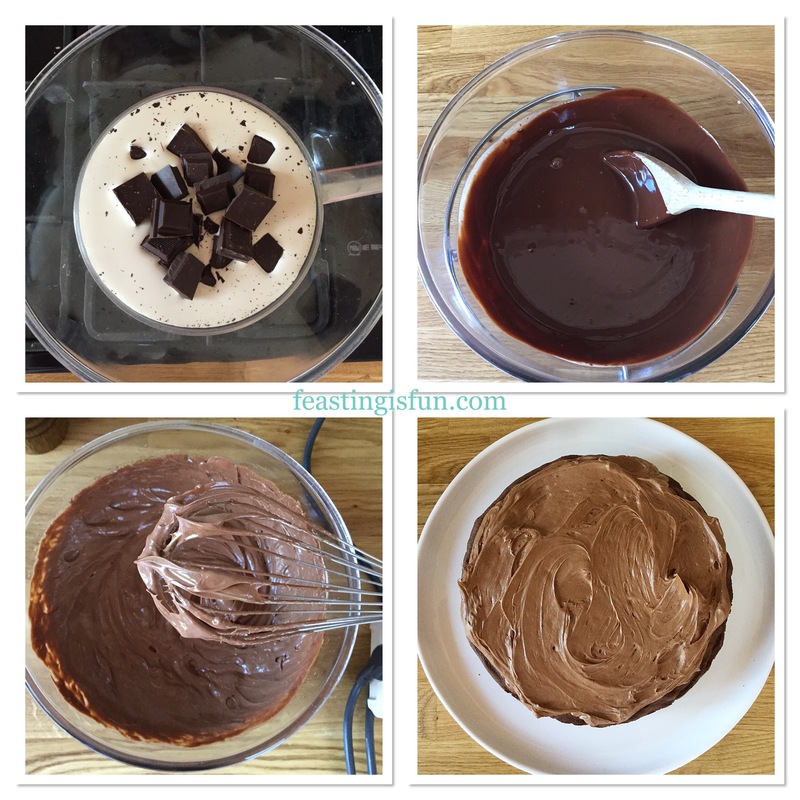 Begin by alternating the cake mixes. 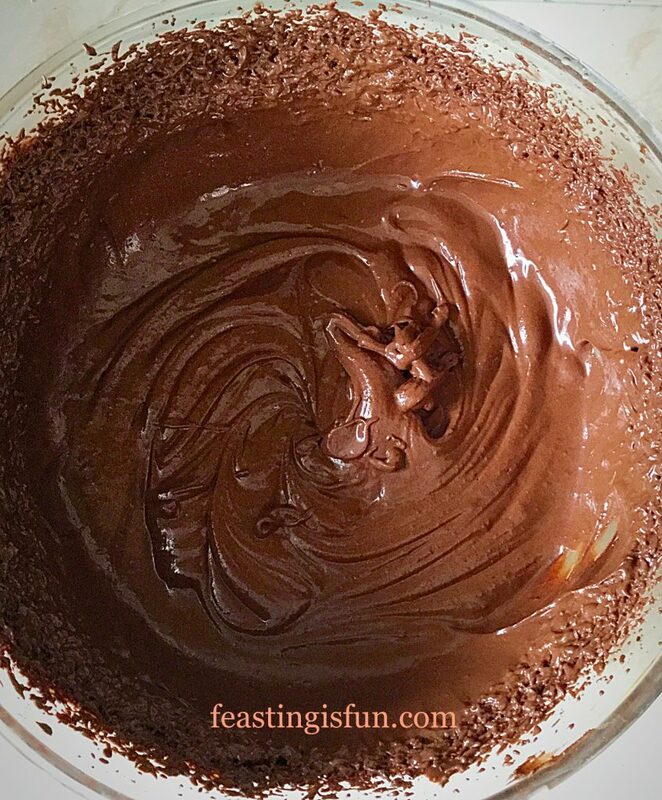 Spoon dollops of the chocolate cake mixture around the base of the tin, leaving a gap in between. In the gaps spoon dollops (sorry but I love that word 😉) of the lemon cake mix. 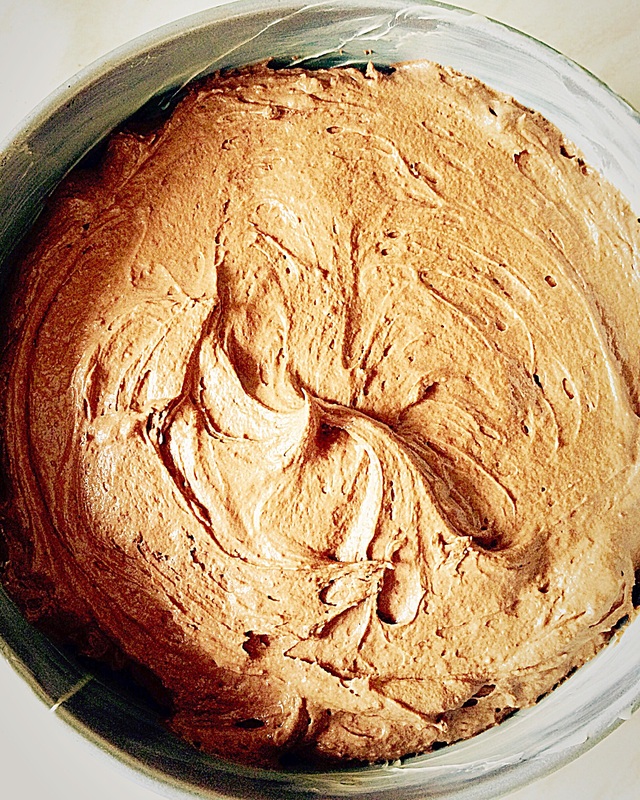 Continue by layering spoonfuls of the chocolate cake mixture on top of the lemon and vice versa. 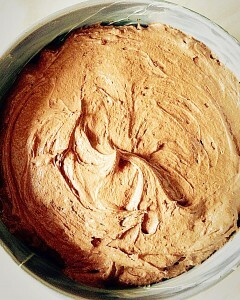 This is how the cake tin looks with all the cake batter added. Now to get swirling! 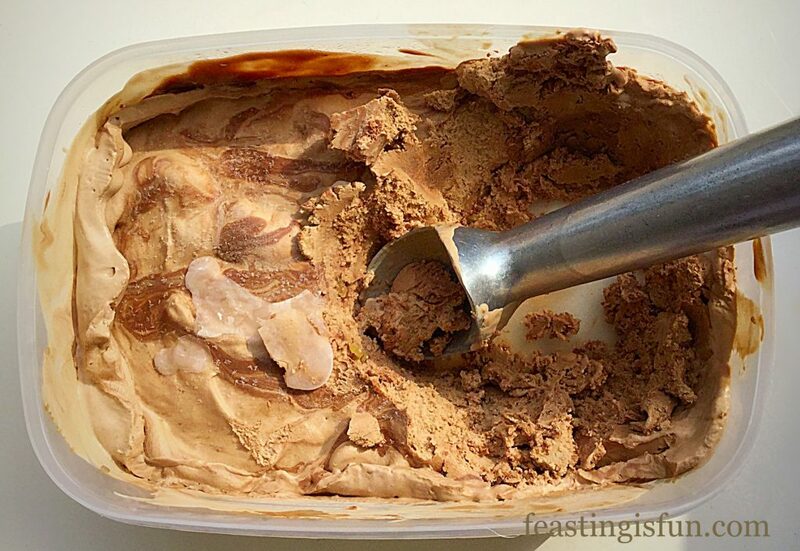 I always use the handle of a wooden spoon, as it won’t rip through the baking parchment. 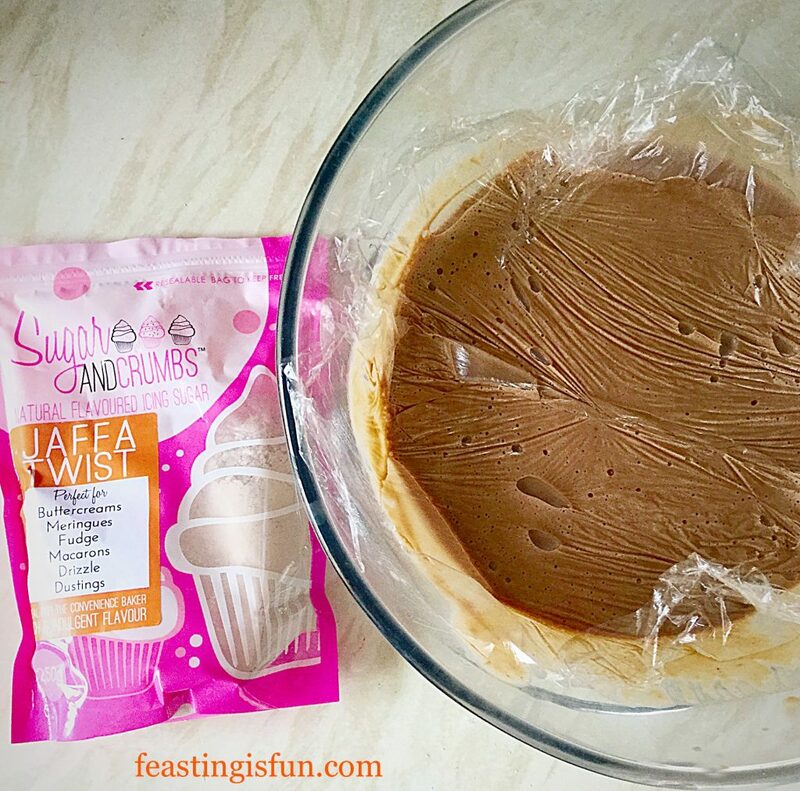 With the upturned spoon in hand swirl through the cake mixture. I like making figures of eight! 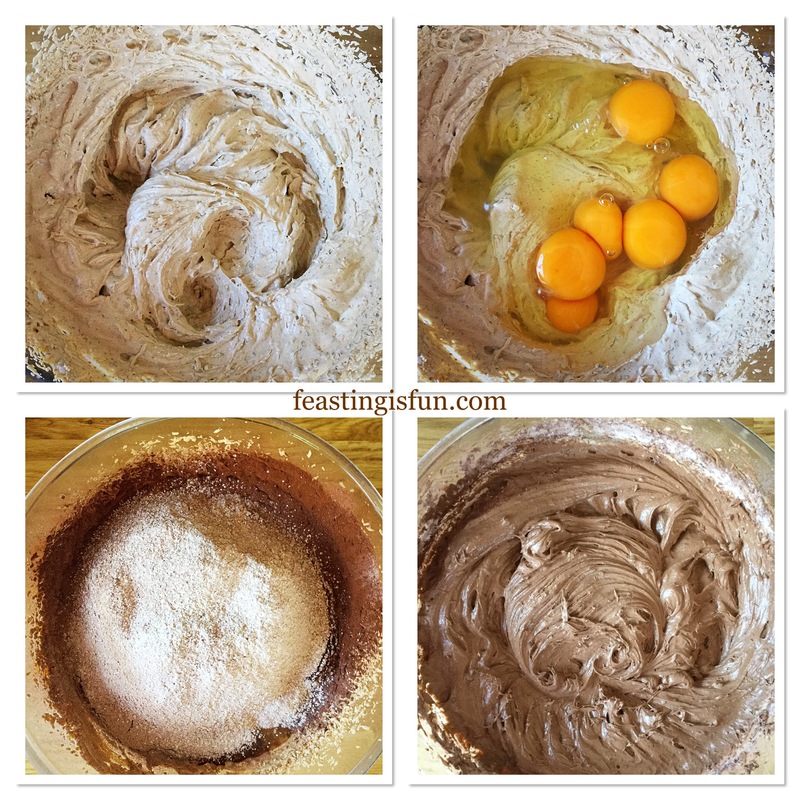 You need the whole cake mix to be marbled NOT mixed. 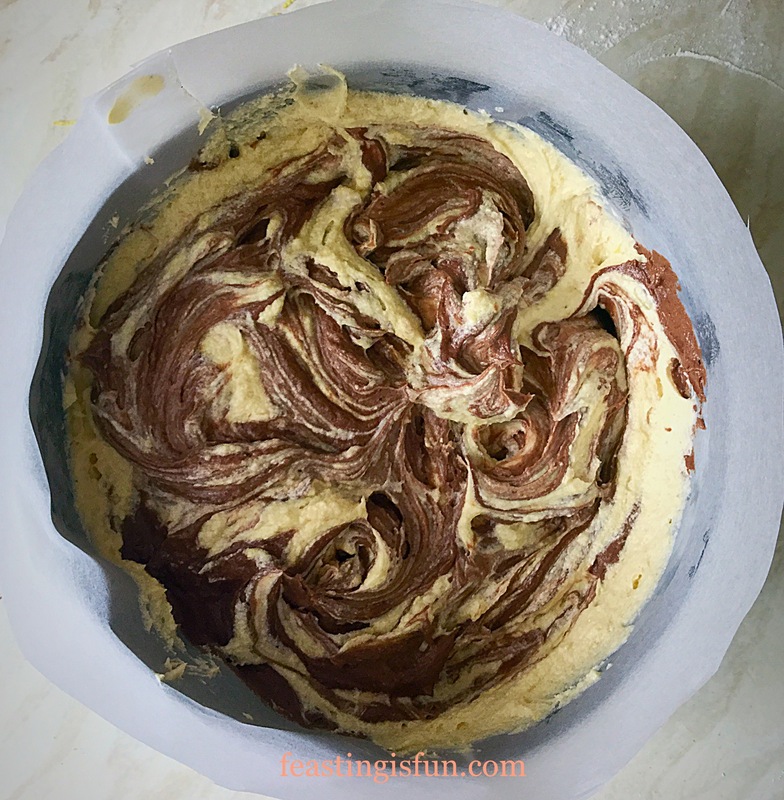 One beautifully swirled marble cake and I stuck the overlapping parchment together with cake batter! 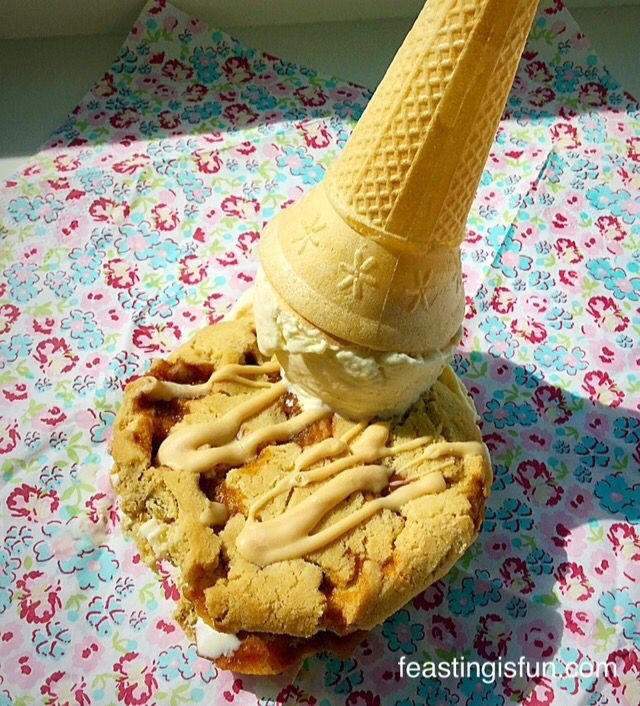 Please don’t worry if you think you’ve over or under swirled your cake. This is a gift for someone. 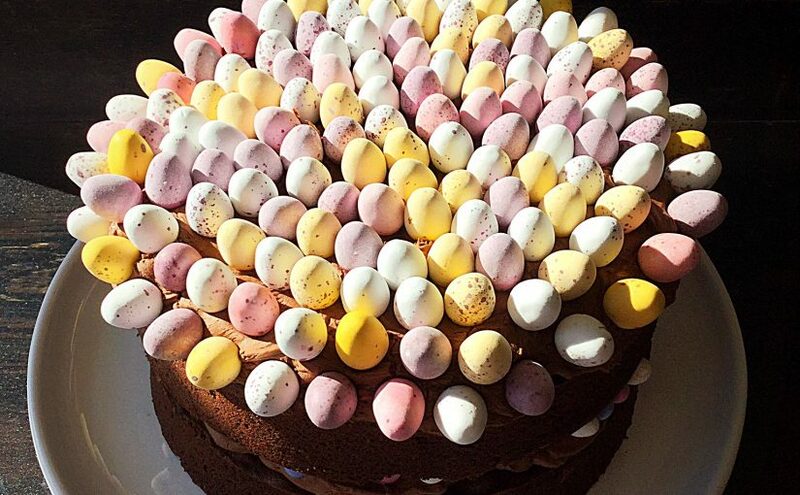 They will love that you’ve taken the time to bake them a cake. 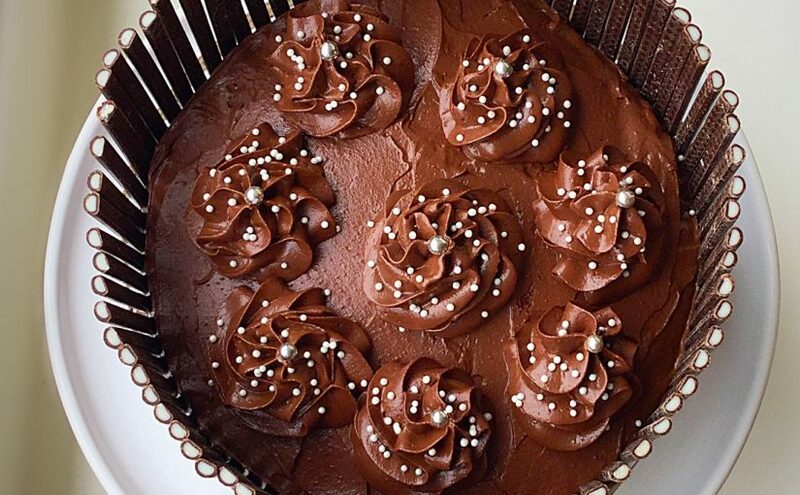 Place the cake in the middle part of the oven and bake for 1 hour 30 minutes – 1 hour 45 minutes. 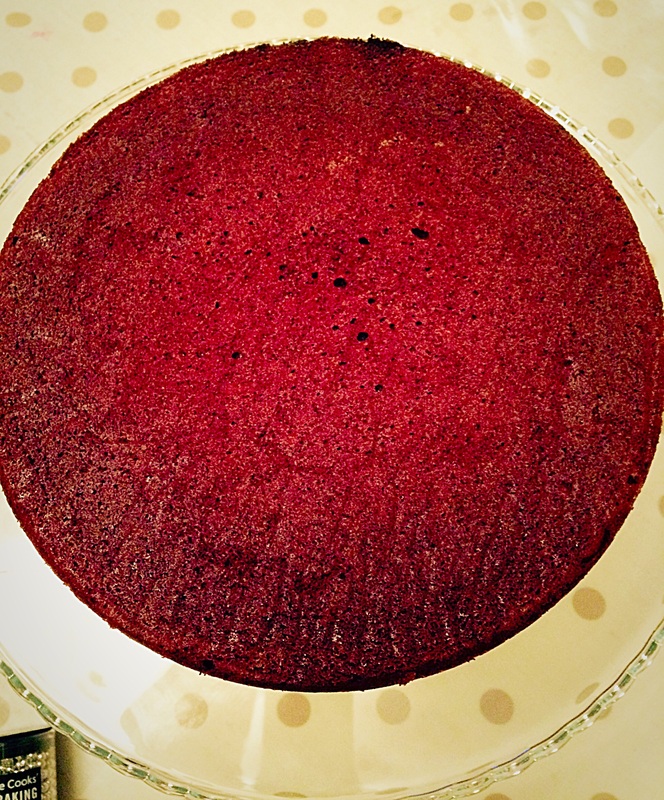 This is a long slow bake that ensures a moist, evenly coloured cake. Please trust me. If you cook at a higher temperature the outside will be baked before the middle and you are likely to end up with a dry cake. 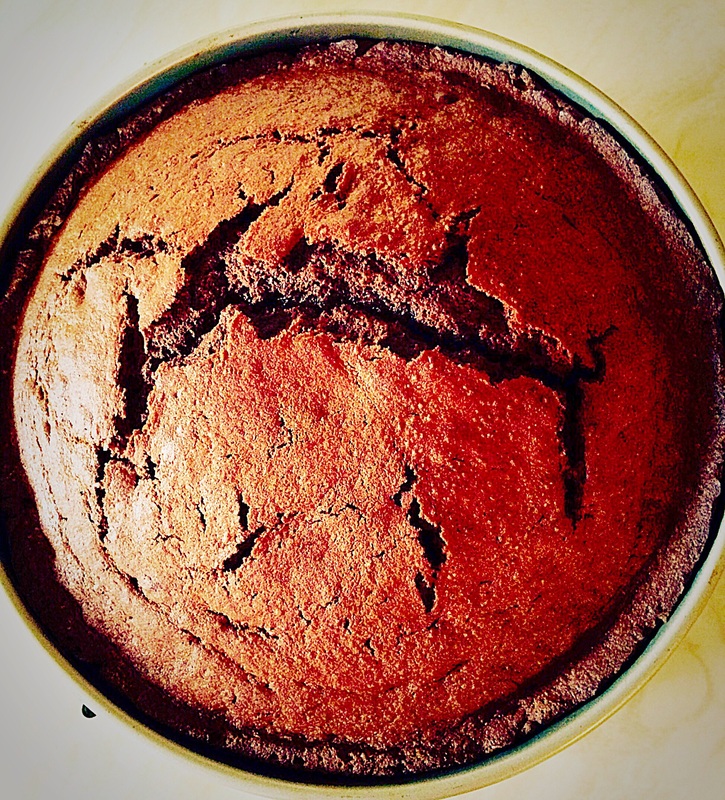 Once baked, remove the cake from the oven, place the tin on a cooling rack and allow the cake to cool in the tin. 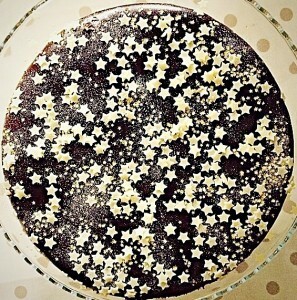 I made this cake the day before I decorated it, however, as long as it is cold it can be decorated on the same day. 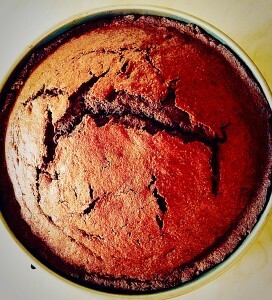 Beautifully baked, don’t worry about any cracks they will settle and close as the cake cools. 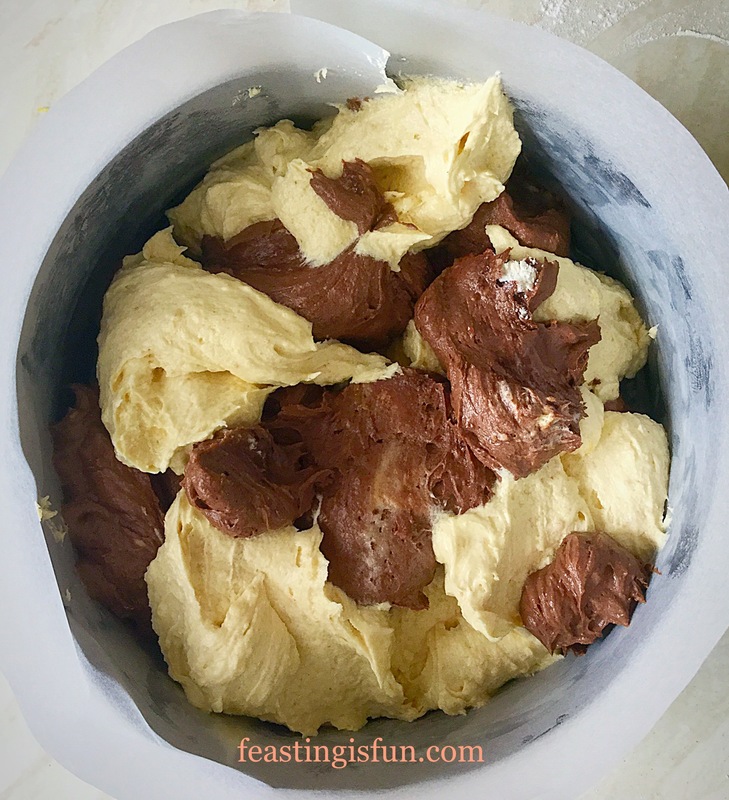 If leaving overnight before decorating, remove the cooled cake from its tin and wrap in cling film. 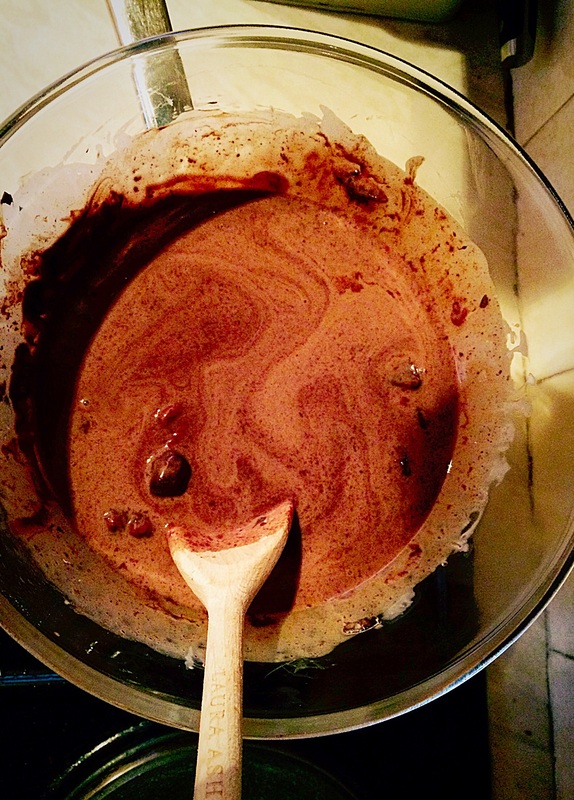 Break up the 250g of dark chocolate and add to a heatproof bowl that fits on top of a small saucepan. 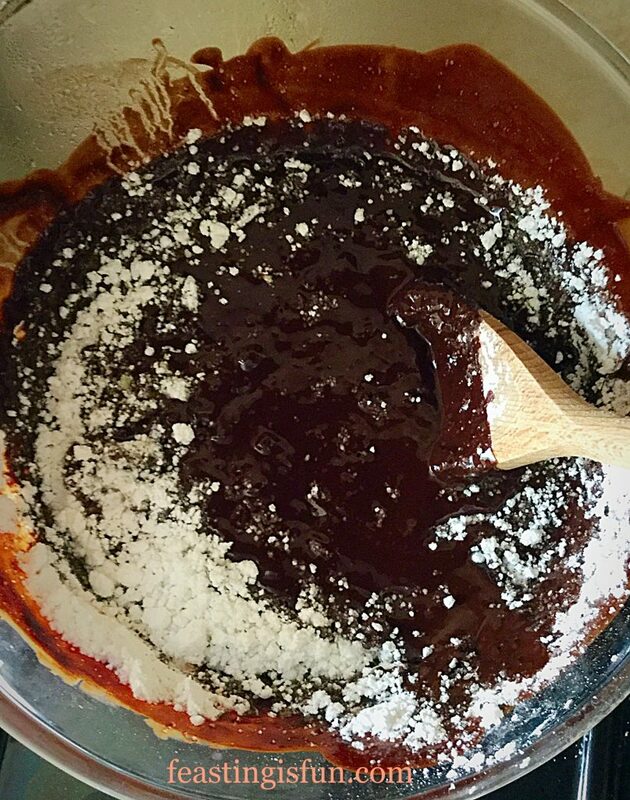 Add the butter to the chocolate. Place 1-2 inches of water in the base of the saucepan and heat until just bubbling. Place the bowl containing the chocolate/butter on top of the saucepan, ensuring the base of the bowl does not touch the water – this is called a double boiler. Stir continuously until both the butter and chocolate have melted. Next add 1 teaspoon of lemon extract (if using) and the sifted icing sugar. 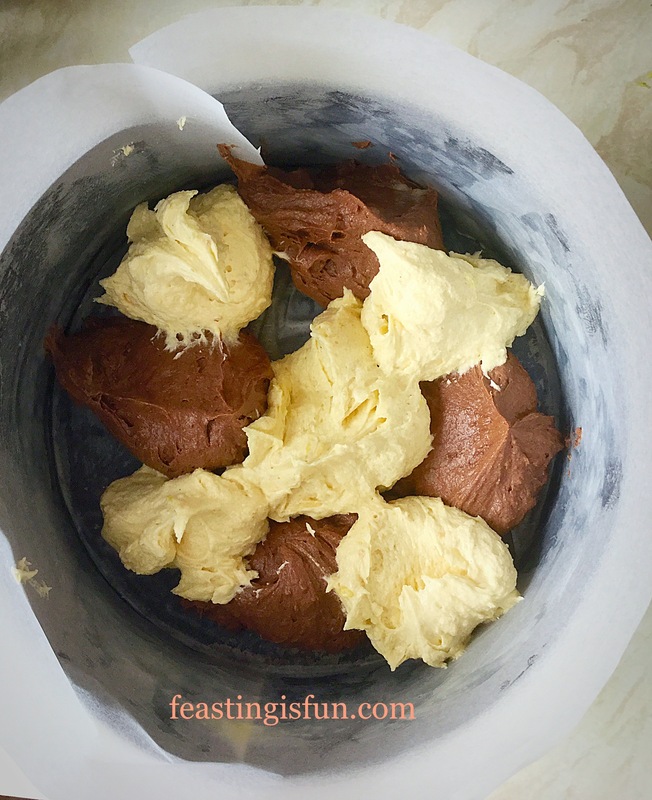 When the icing sugar is no longer visible remove the bowl from the heat and very gently, as this mixture will be hot, switch to a balloon whisk and stir, then whisk as the mixture cools, until all icing sugar has dissolved. 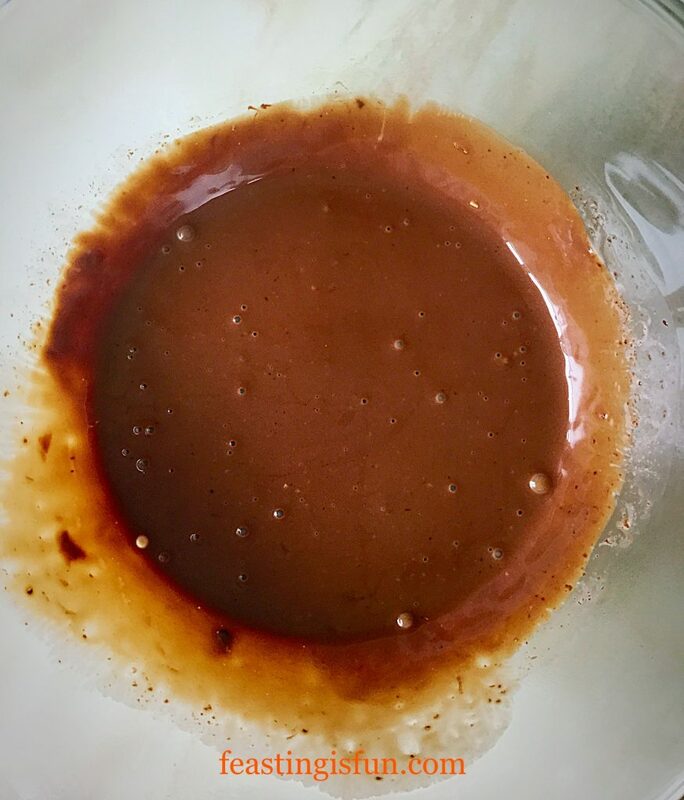 The best way to tell if the mixture is smooth is to rub a little between your finger and thumb, if it still feels gritty keep whisking – it took 5 minutes of gentle whisking until my ganache was smooth again. 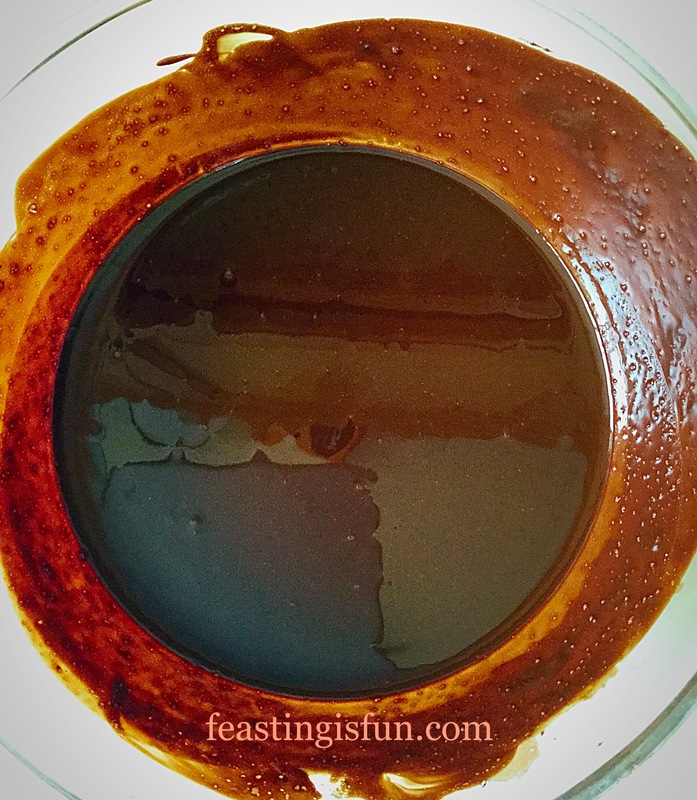 Glossy, silky smooth chocolate lemon ganache. Next switch to an electric mix and whisk gently, increasing in speed as the ganache starts to thicken. Keep whisking until the mixture is still soft but will hold a figure of eight. 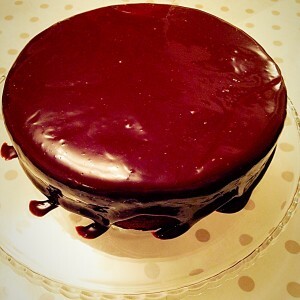 Thickened ganache that can hold its shape – but not stiff. Place half of the ganache into a piping bag fitted with a large star. 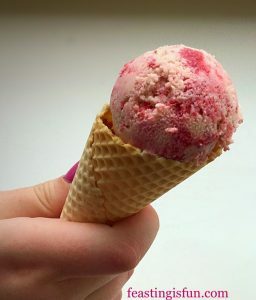 If it is a hot day cover the nozzle with cling film and place in the fridge. 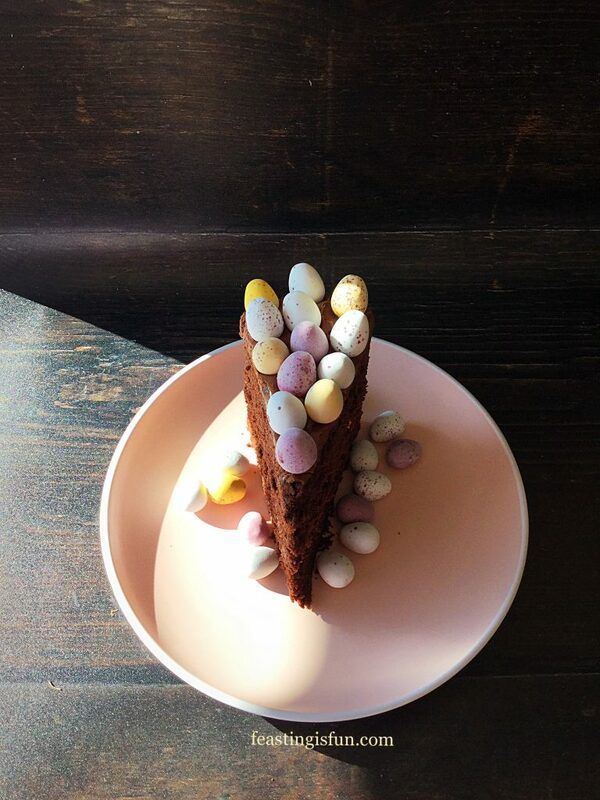 Place your cake on a board or cake stand. I suggest placing the board on a cake stand as it makes the cake easier to decorate. Spoon 3/4 of the remaining ganache on to the top of the cake. 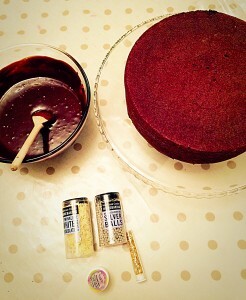 Using an off set palette knife spread the mixture so that it covers the top of the cake. It’s a thick coating don’t worry! 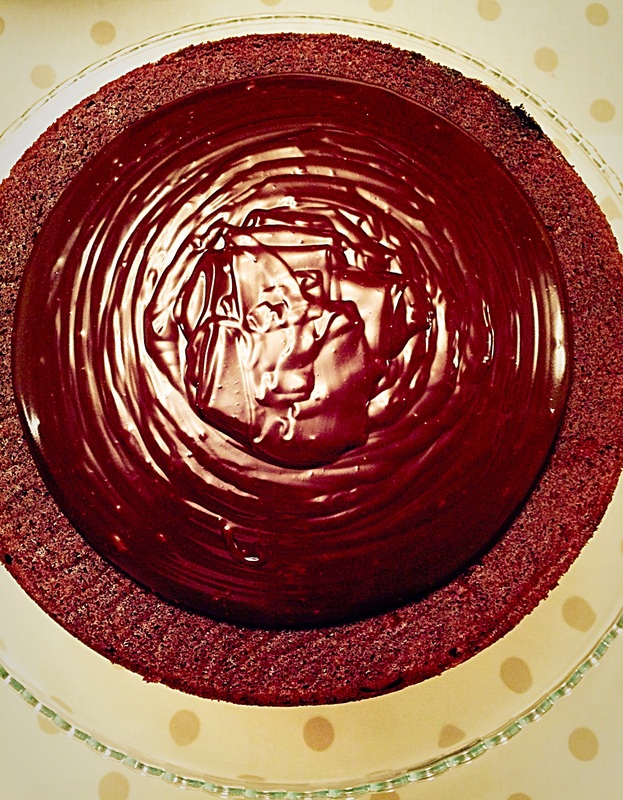 Spoon the rest of the ganache around the outside edge of the top of the cake. Gently, with your palette knife encourage the icing to cover the side of the cake. Turning the cake stand as you go, working round until the sides are covered. 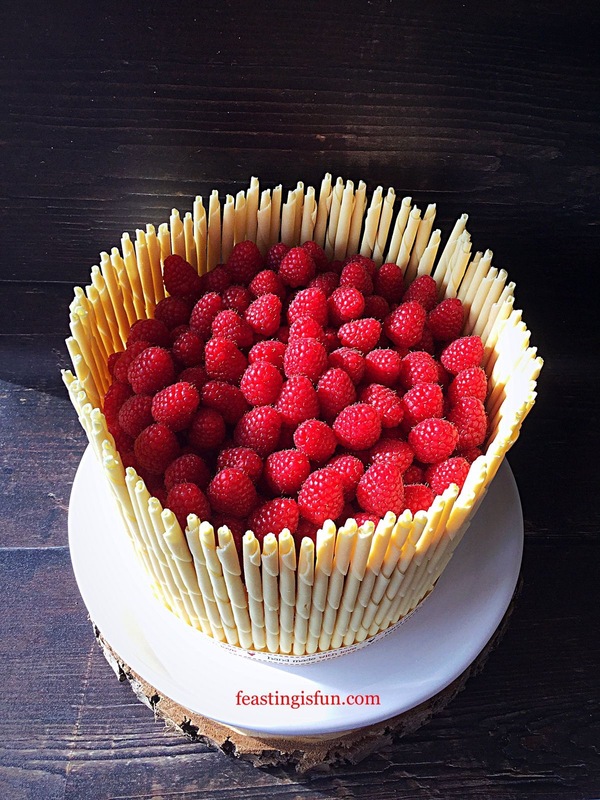 Hold your palette knife flat against the side of the cake and rotate the stand. This will give your sides a nice even edge. 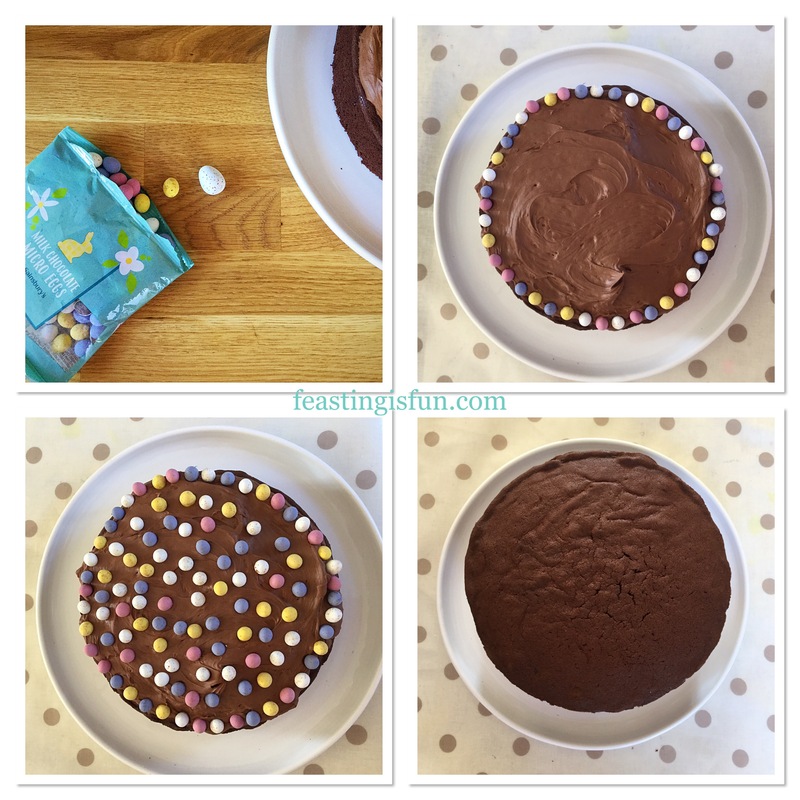 Run your palette knife flat across the surface of the cake to achieve the same effect. 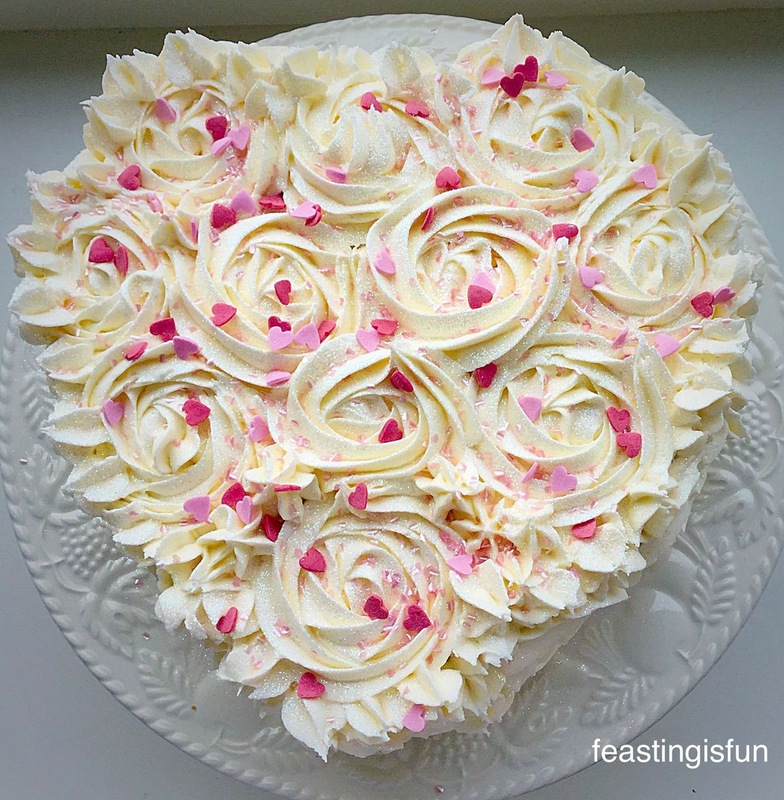 Don’t worry if it’s not perfectly flat, as long as the icing is even it will look great. Next pipe swirls around the edge of the cake and finish with one in the centre. Look how beautiful your cake is! Have the flutes opened and ready. You will see that one side of the flute is flat. 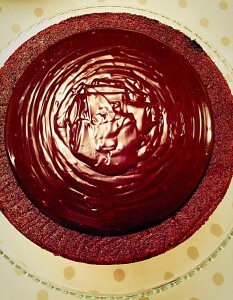 Press the flat side of the flute against the base of the cake, the ganache will hold it in place. Continue, placing one flute next to another, taking care to ensure they are straight, until the whole cake is surrounded. 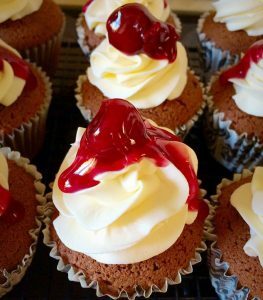 Take your ribbon, place it halfway up the flutes – it is helpful if you have a spare pair of hands to hold it in place, if not use a pin to secure it at the back of the cake – wrap it around the cake and tie a bow at the front. Place a silver dragee ball on the top of each swirl and add extra small, edible pearls to the swirls. 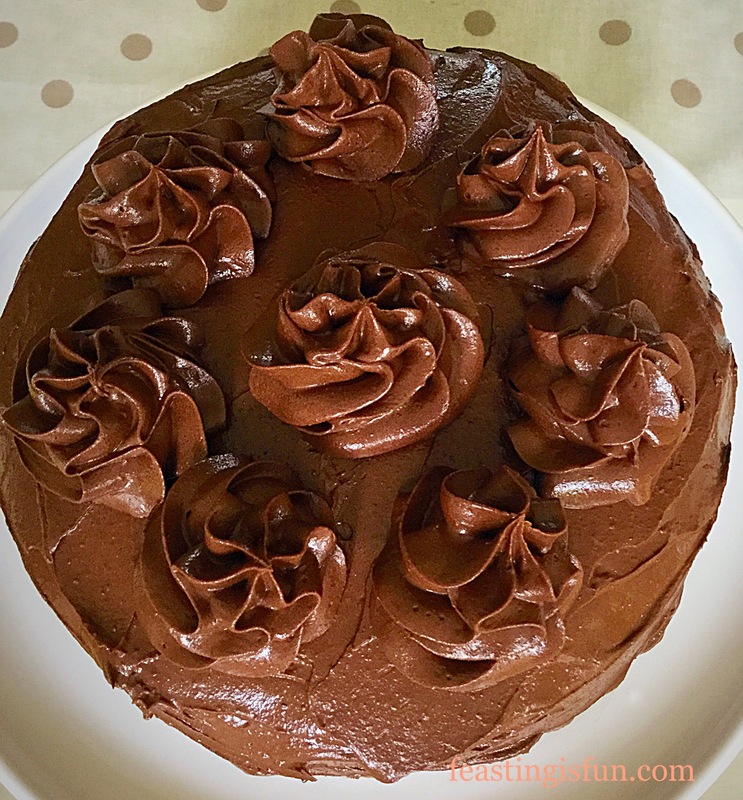 Fluted Chocolate Lemon Marble Cake simply stunning. 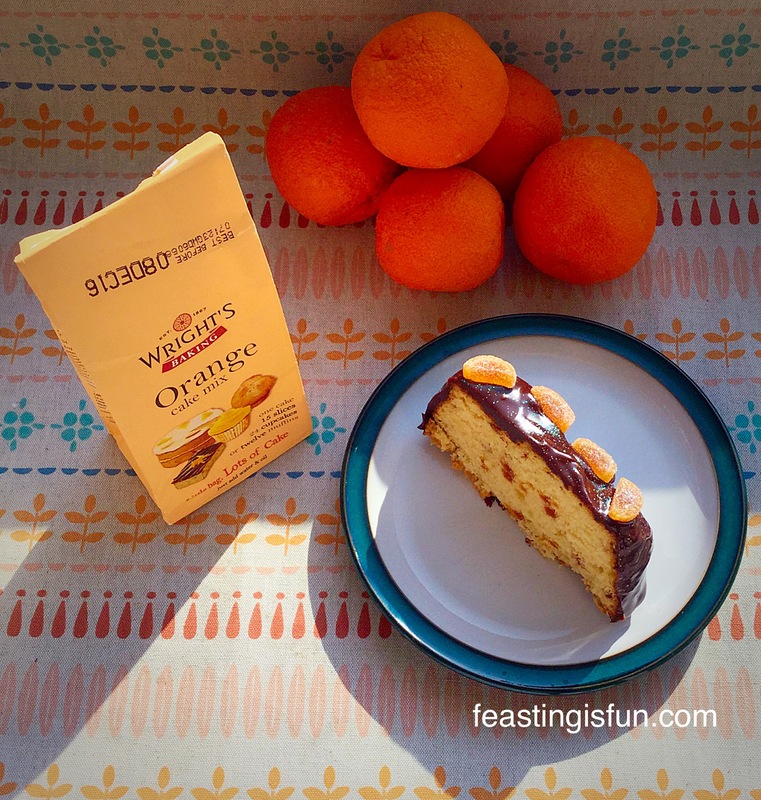 Serve your stunning Fluted Chocolate Lemon Marble Cake sliced with a cup of tea or coffee and a big smile. 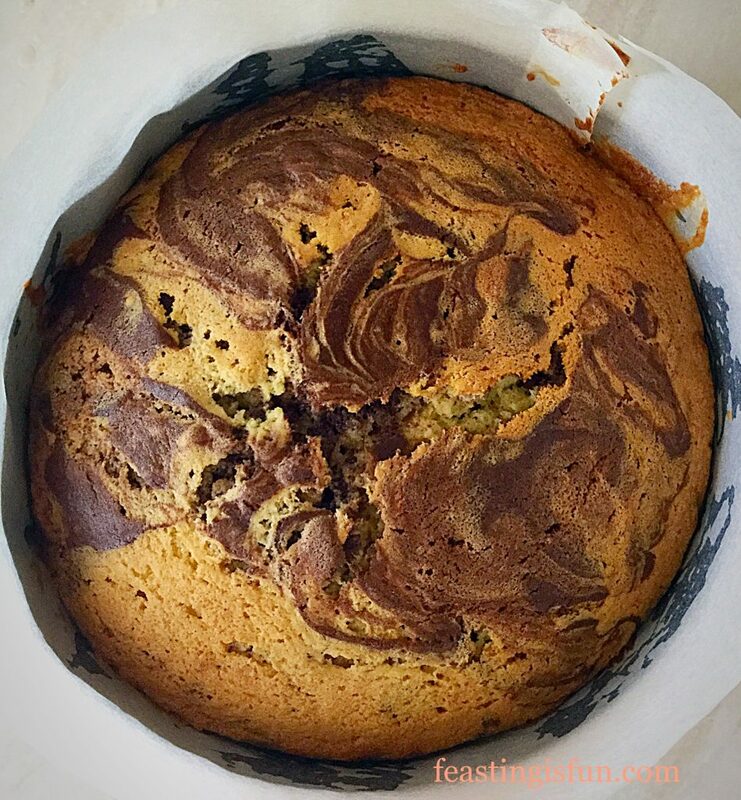 This beautiful Fluted Chocolate Lemon Marble Cake, made with love and shared with your Dad, or friends and family for a special celebration is sure to wow and impress them with the delicious flavour combination! 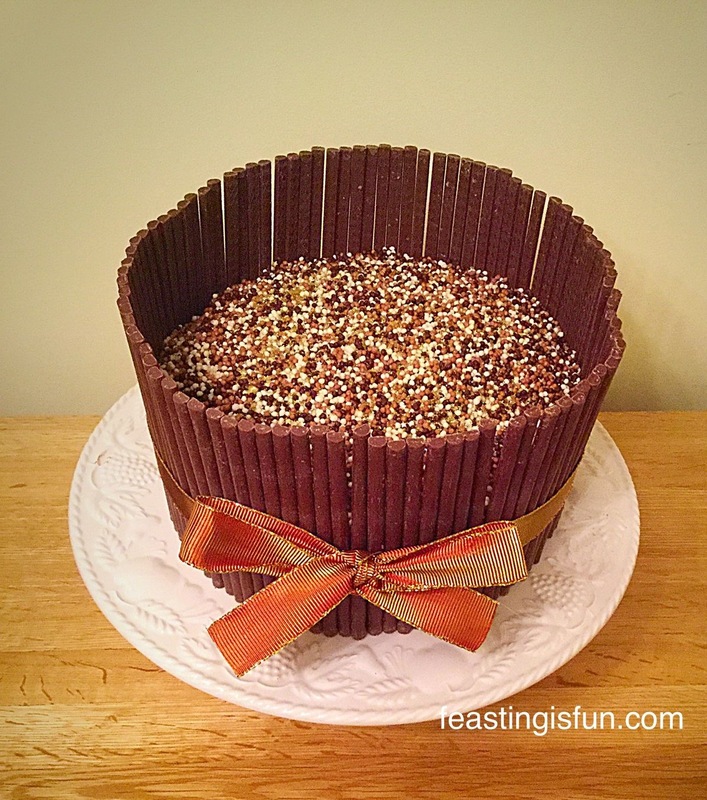 Chocolate Amaretto Cake using amaretto flutes. 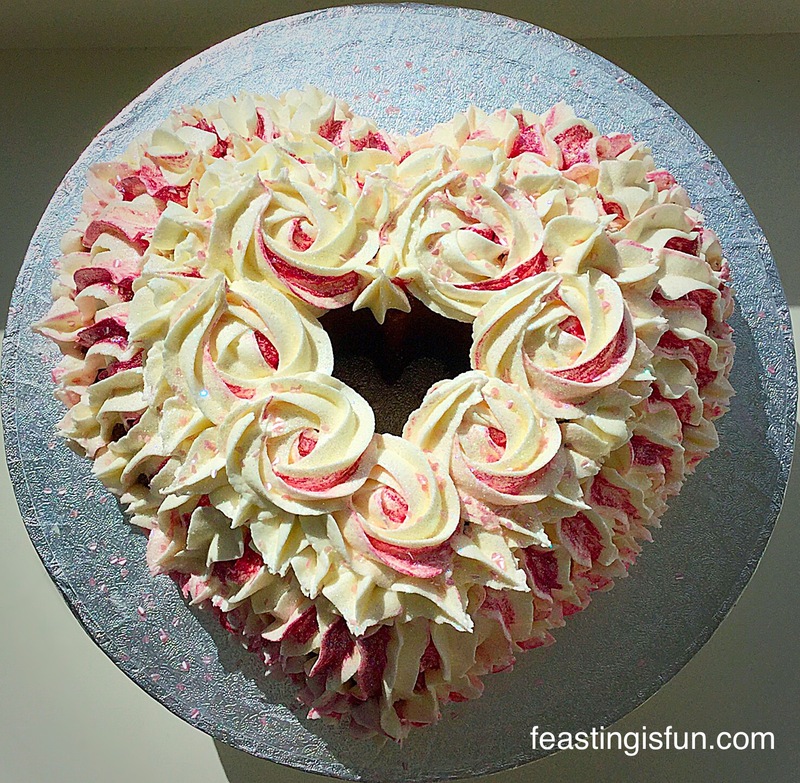 Strawberry Sweetheart Cake perfect for the ones you love. 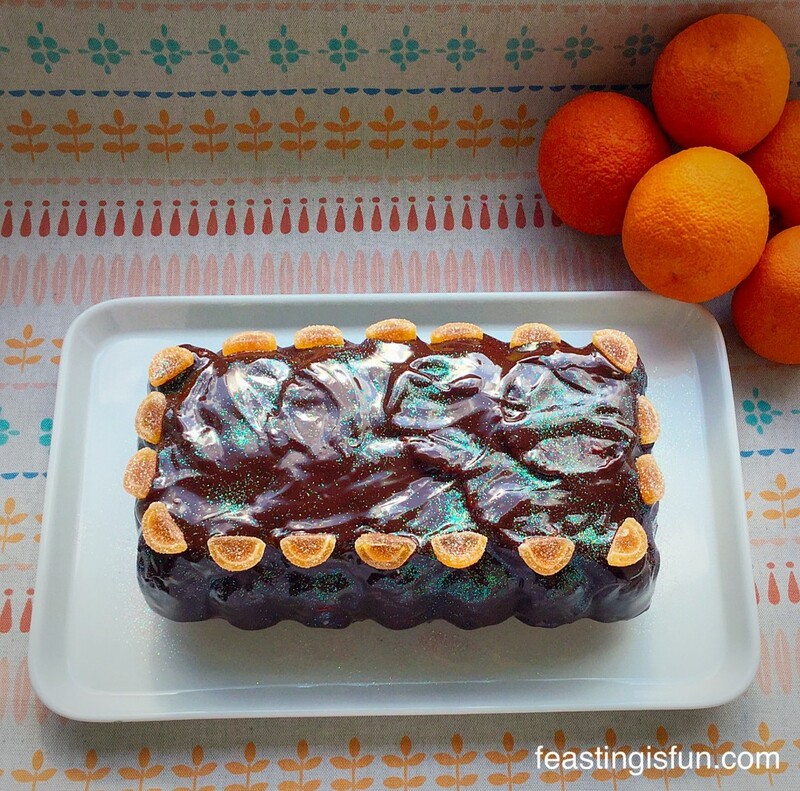 The Fluted Chocolate Lemon Marble Cake is beautifully rich, decadent and full of flavour. 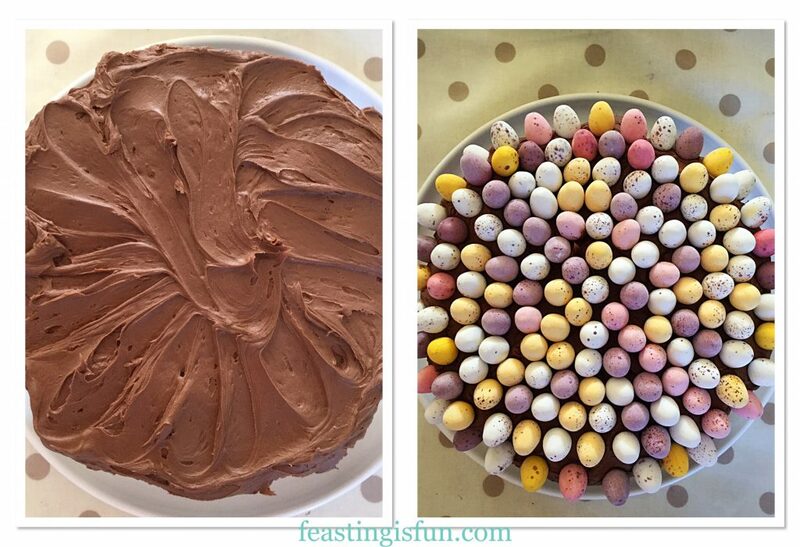 I hope you enjoy the calming practise of baking and then decorating a cake. Yesterday I was not having the best of days and yet, sitting decorating this cake, I became totally immersed in what I was doing. Afterwards I felt a lot better and I had accomplished something that I hadn’t done before. 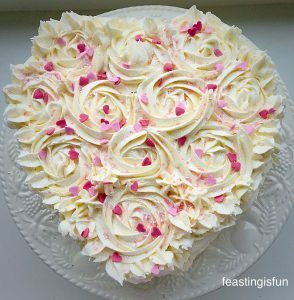 I recommend baking and cake decorating as a very therapeutic, calming practise. Even if you don’t feel any better at the end, your time will have been well spent. Enjoy creating and baking in your kitchens. A feast, whether a cake or a roast chicken, made with love and shared is a hard experience to beat. Elizabeth Shaw Chocolates provided me with the flutes to decorate this cake. I did not receive any payment for writing this post. 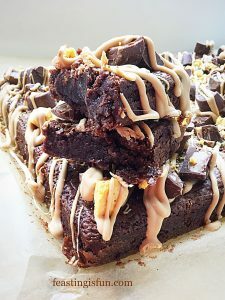 All content, recipes, photographs and opinions are my own. I am not a proffessional, any advice given is my own personal opinion. Please see my Disclosure Policy. Ooh hello my lovelies, have I got a treat for you today? Yes of course I have and a dazzling one at that. 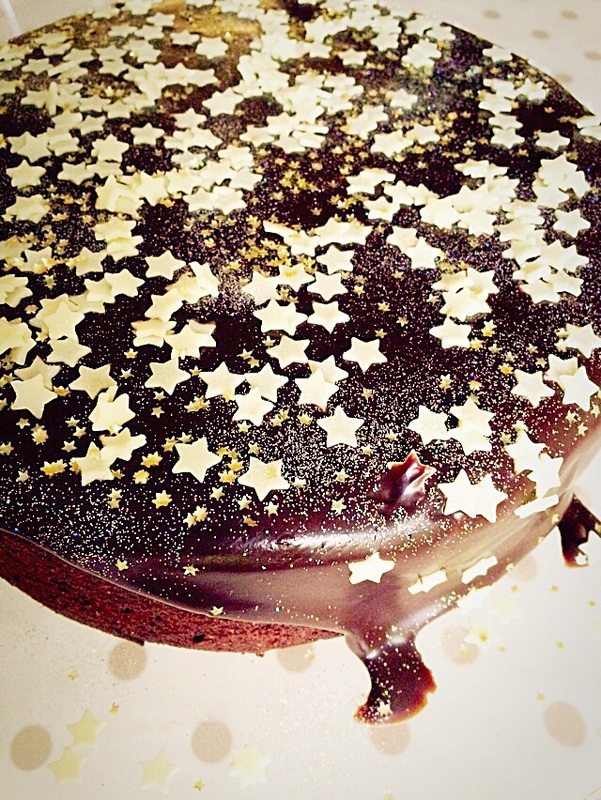 Welcome to my Chocolate Sparkle Cake! It’s ok you can read through once you’ve looked at all the photo’s – I would!!! 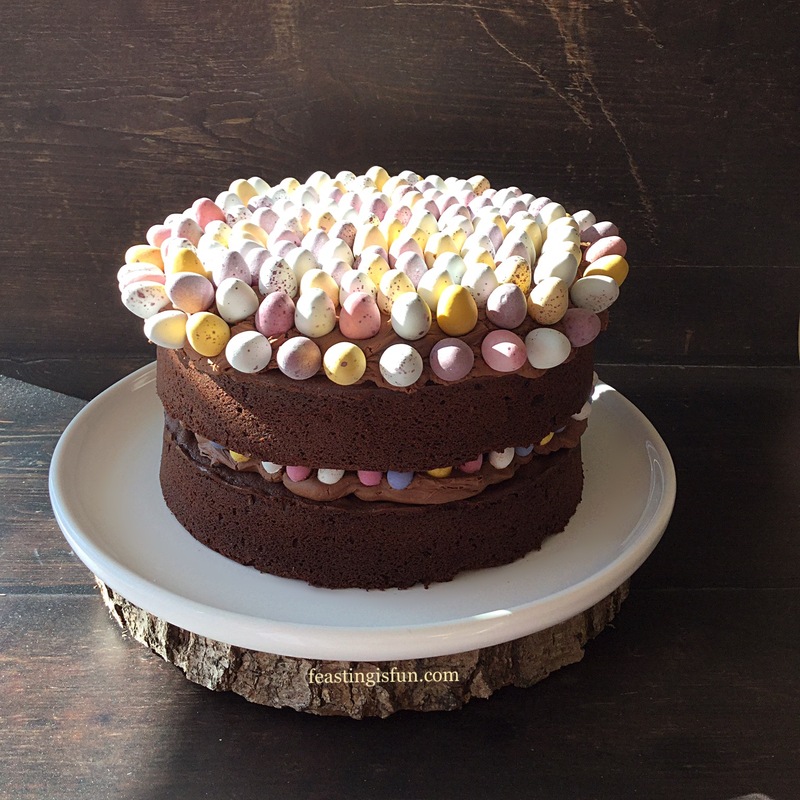 This cake was inspired by Bonfire Night ( November 5th if you’re not from the UK). Our children were being taken to an amazing fireworks party by my wonderful sister and brother-in-law, along with their cousins. 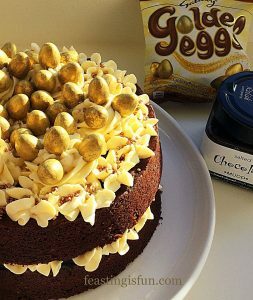 While they were out I wanted to make a cake, that on their return would make them say “Wow” and remind them of the fun they’d had. 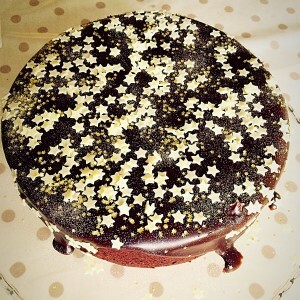 So being our children meant this had to be a Chocolate Cake. 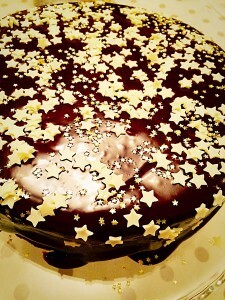 I wanted a deep, chocolatey, moist cake, smothered in thick, glossy, chocolate ganache and then topped with as many sprinkles I could get my hands on. 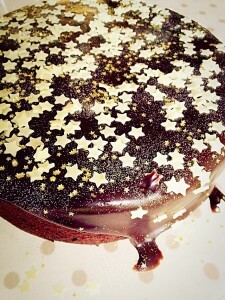 Thus the Chocolate Sparkle Cake idea was formed in my head. Knowing that I didn’t want a layer cake, it was important to ensure the cake itself was as moist as possible. 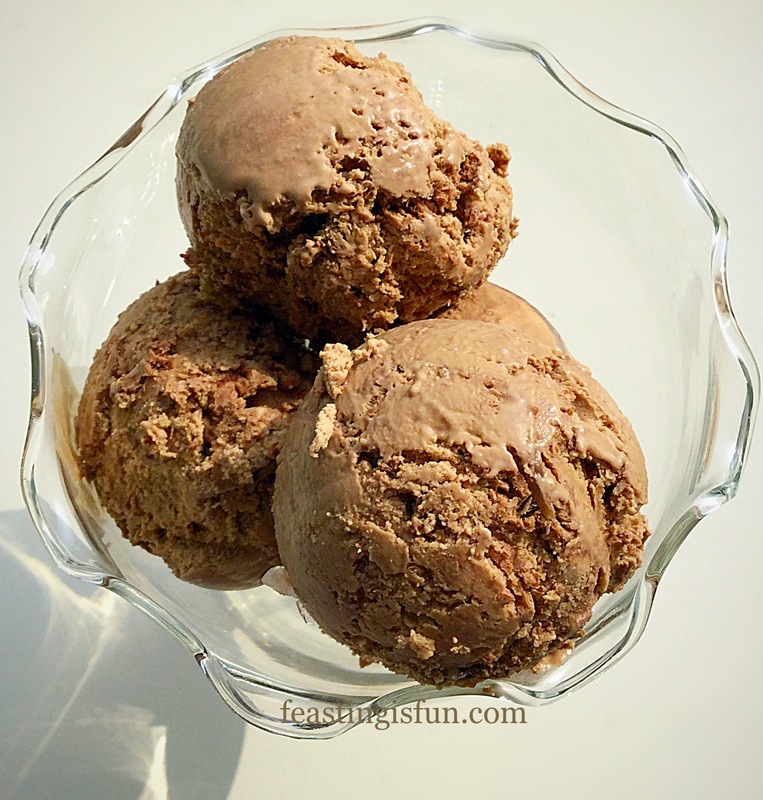 Since adding cocoa to any batter has a drying effect, so to counter that I added sour cream. 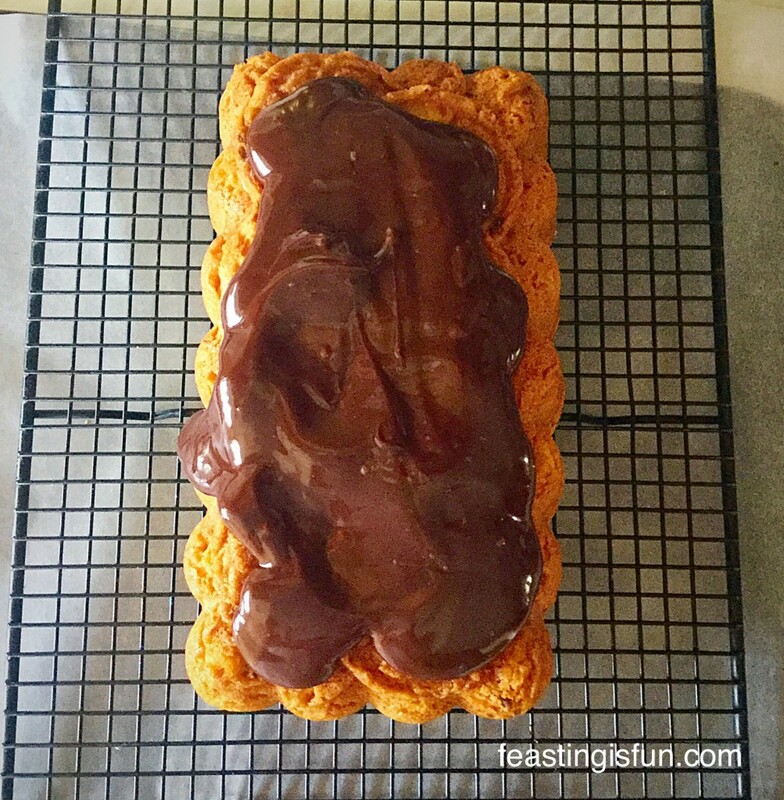 I’d seen Ina Garten add it to many of her bakes and figured it was worth a try. Yep I was winging it yet again! Oh my. I soo made the right decision. Because you cannot taste the sour cream in the baked cake, however, the baked cake has such a moist, tender crumb. 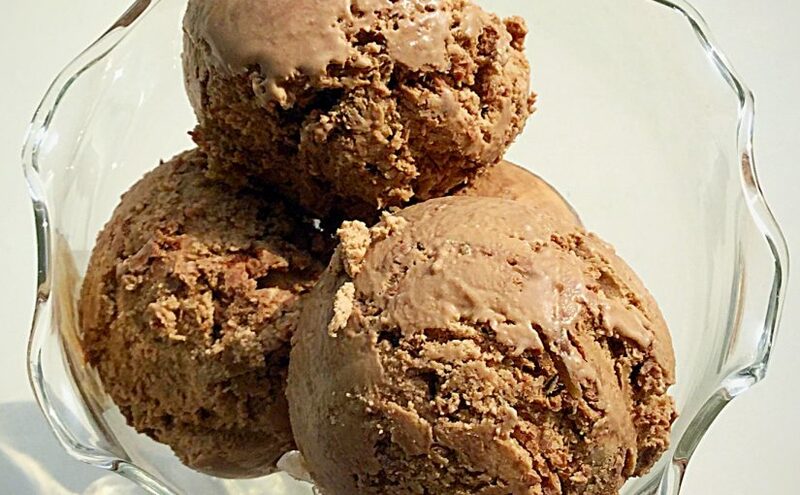 This is one ingredient I will be experimenting with more, that’s for sure. What really sends this cake over the top flavour-wise is the addition of liqueur to the chocolate ganache. I happened to have an unopened bottle of Chocolate Bailey’s Luxe. So I added some. Mmm another brilliant decision, I was truly on a roll! I only used a small amount and it is totally fine to leave it out altogether. Our youngest is 13 years old so I was happy for him to have a very small, diluted amount. 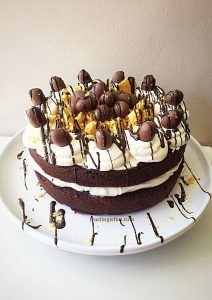 I would say that this cake is both decadant and rich. All three of our children and all the adults loved it. 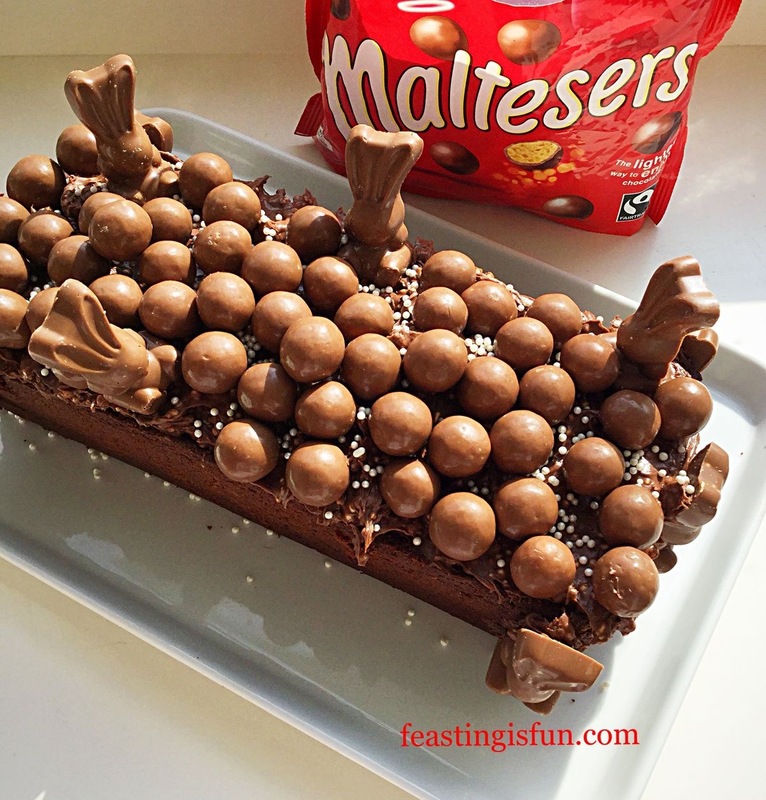 I’m not sure if it’s richness would be enjoyed by younger children, even with the absence of liqueur? 275g/10oz Unsalted Butter at room temp. 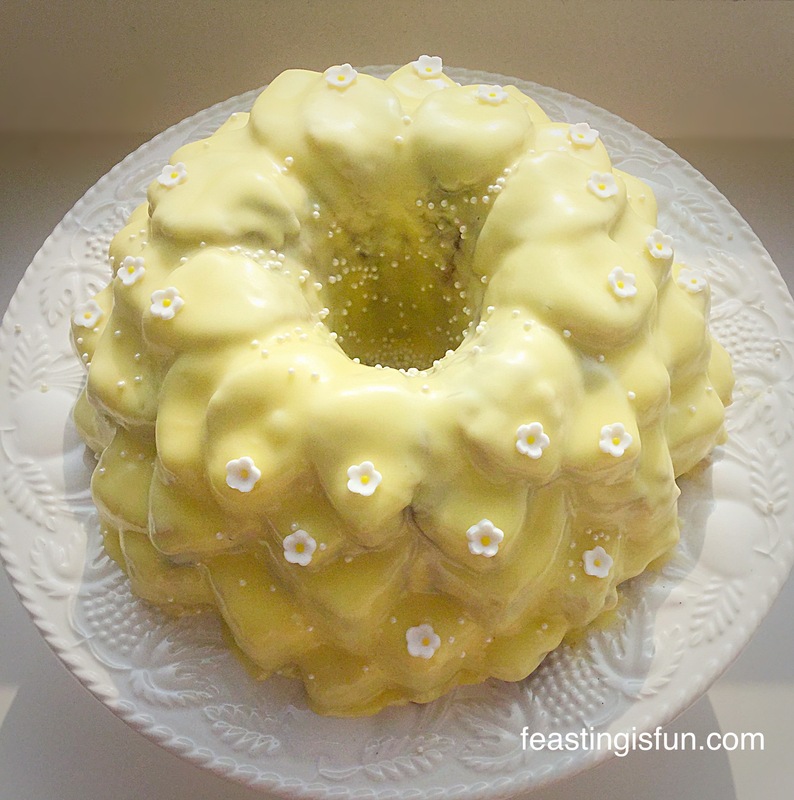 First of all, butter the base and sides of a 10″ Springform cake tin. Line the base of the tin with baking parchment paper. 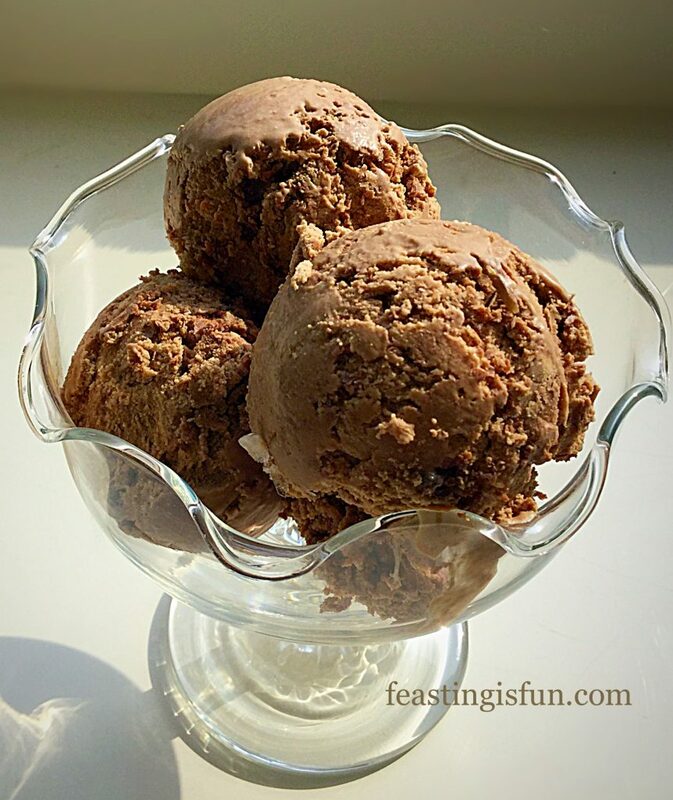 Sift the flour, cocoa, baking powder and salt together. These are your dry ingredients. Crack all the eggs into a jug, add the vanilla extract and lightly beat with a fork to break up. Add one third of your dry ingredients and mix slowly, as they start to incorporate add half of your eggs. 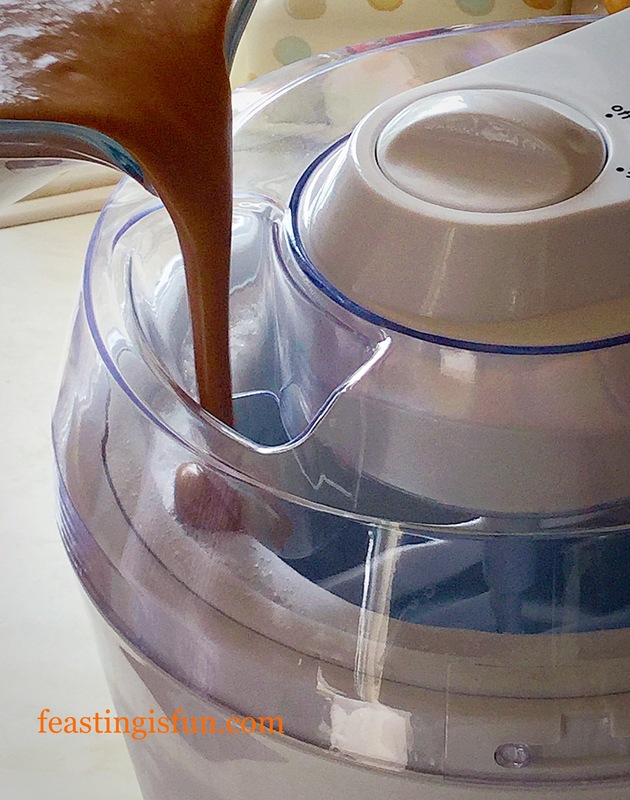 Continue mixing until all the ingredients are almost incorporated. Add the last of the dry ingredients until thoroughly mixed. 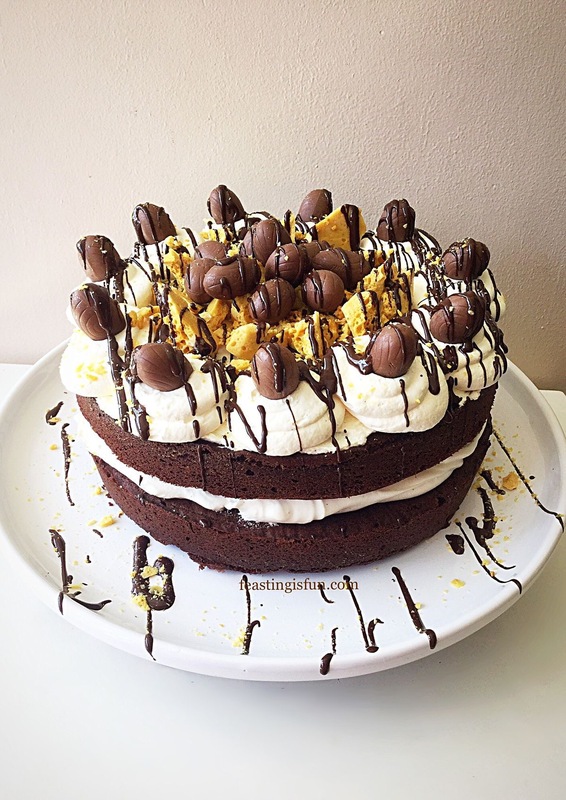 Be careful not to overmix, as the cake will be heavy. Fold in the sour cream to the chocolate cake batter. Delicious, moist, chocolate cake batter. 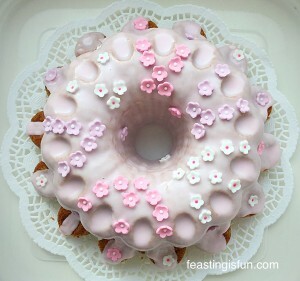 Fill the cake tin with batter and smooth the top. Place the cake tin in the middle of the oven and bake for 50 minutes. 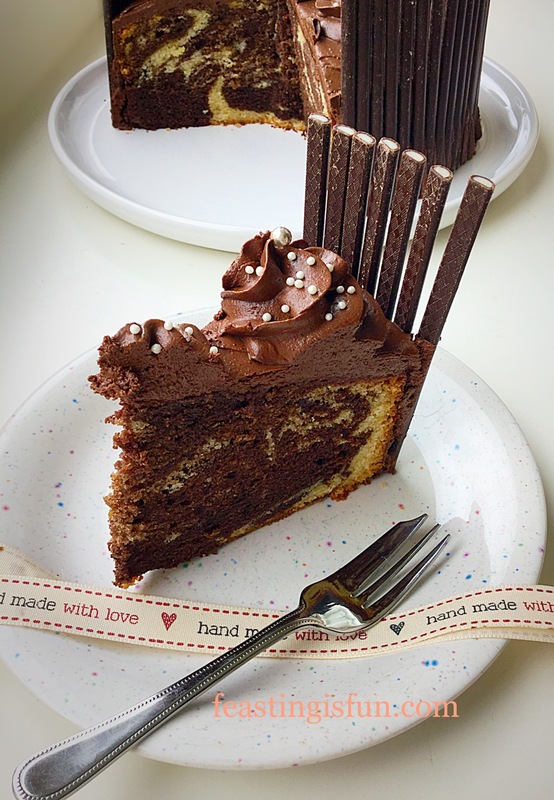 The cake is baked when an inserted skewer comes out clean. 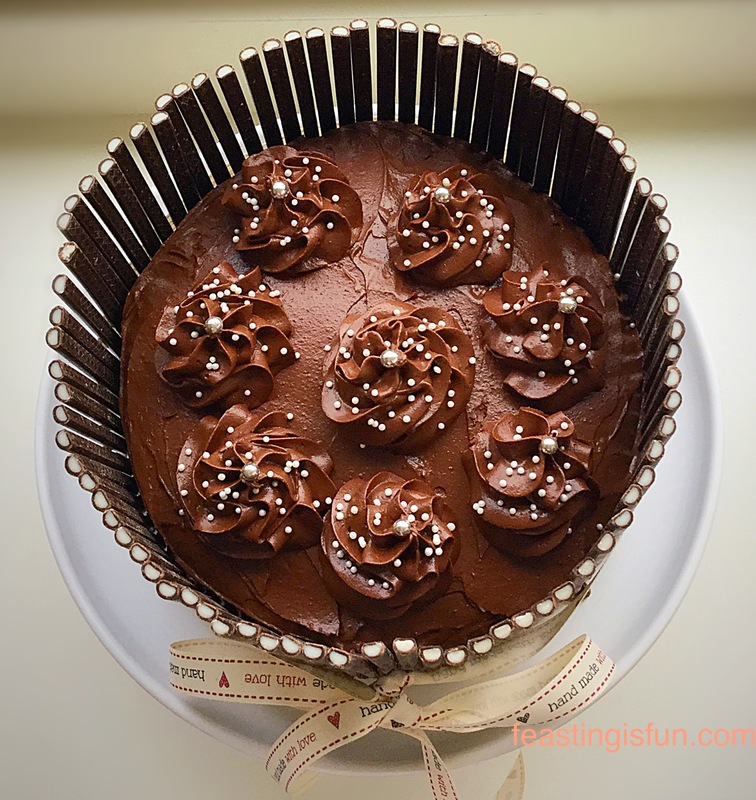 If after 50 minutes the cake is still not fully baked, place back in the oven and re-check at 5 minute intervals. As soon as the cake is baked remove the oven. Don’t worry about the small crack it will reduce and we are turning the cake over to frost!! 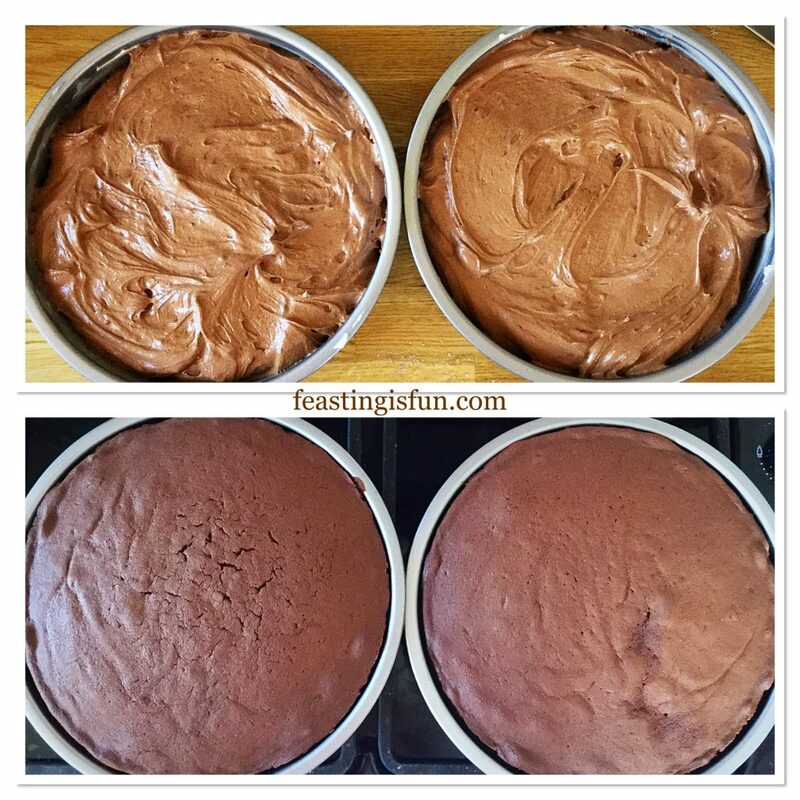 Allow the cake to cool for 15 minutes before removing from the tin. To remove, release the springform lever, remove the outer ring of the tin. 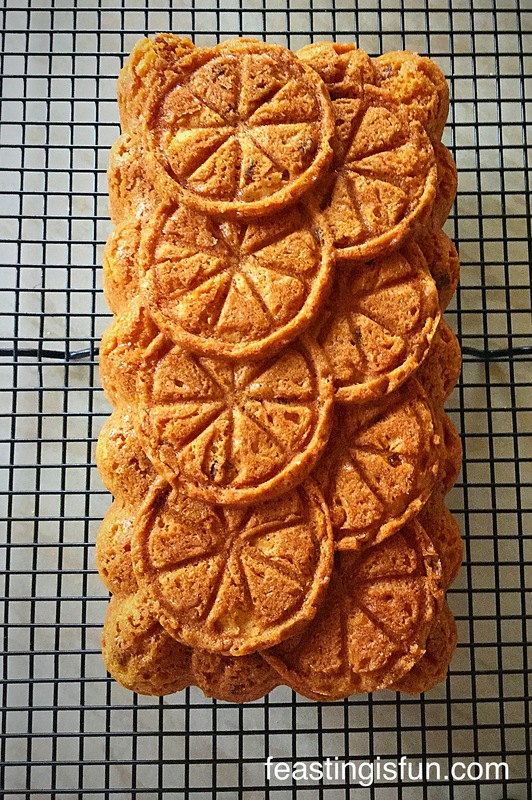 Place a cooling rack on top of the cake and invert. The cake is now bottom side up on the cooling rack. Remove the tin base and gently peel off the baking parchment paper. 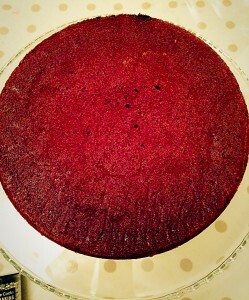 Place to one side and allow the cake to cool completely. Break or chop the chocolate into small chunks. Place in a heat proof bowl over a saucepan of barely simmering water (double boiler), ensuring the base of the bowl does not touch the water. 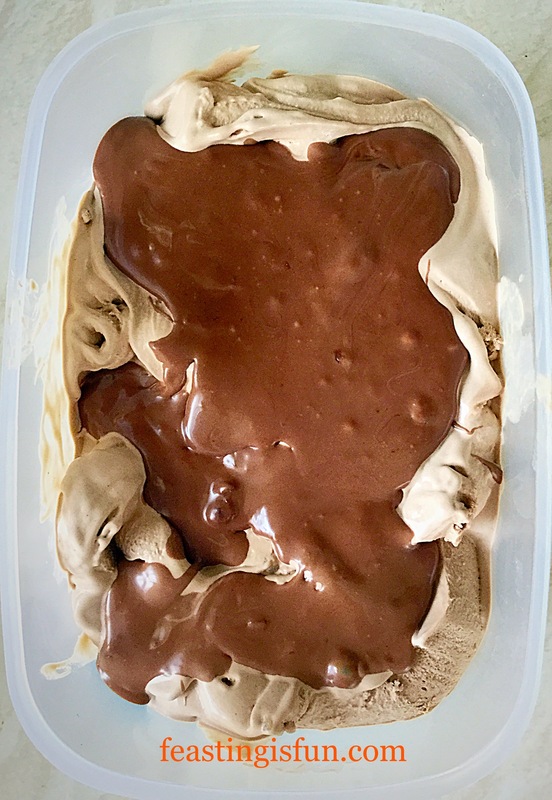 Keep stirring the chocolate/cream until the chocolate has completely melted. 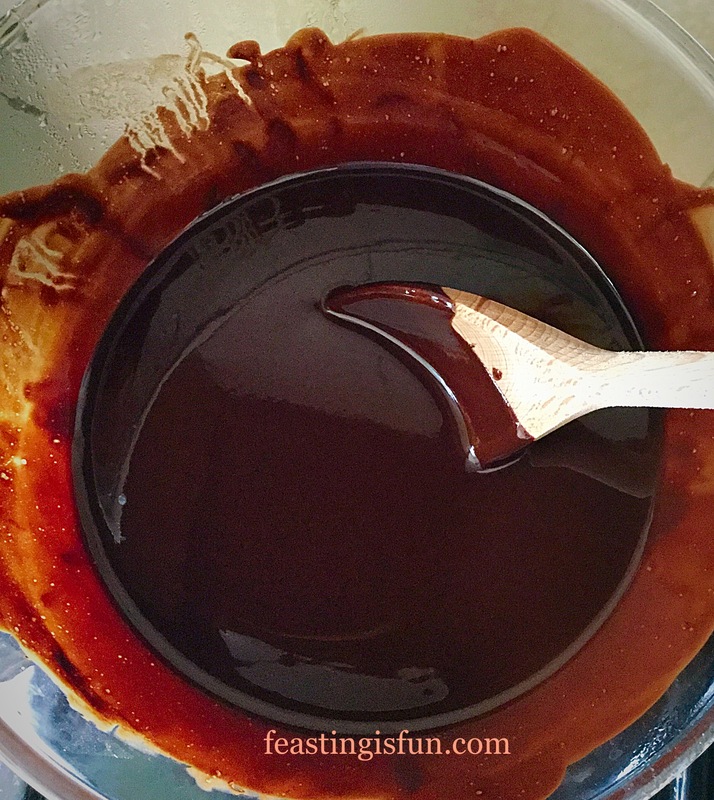 Remove from the double boiler, add the liqueur and stir well. Set aside to cool and thicken. 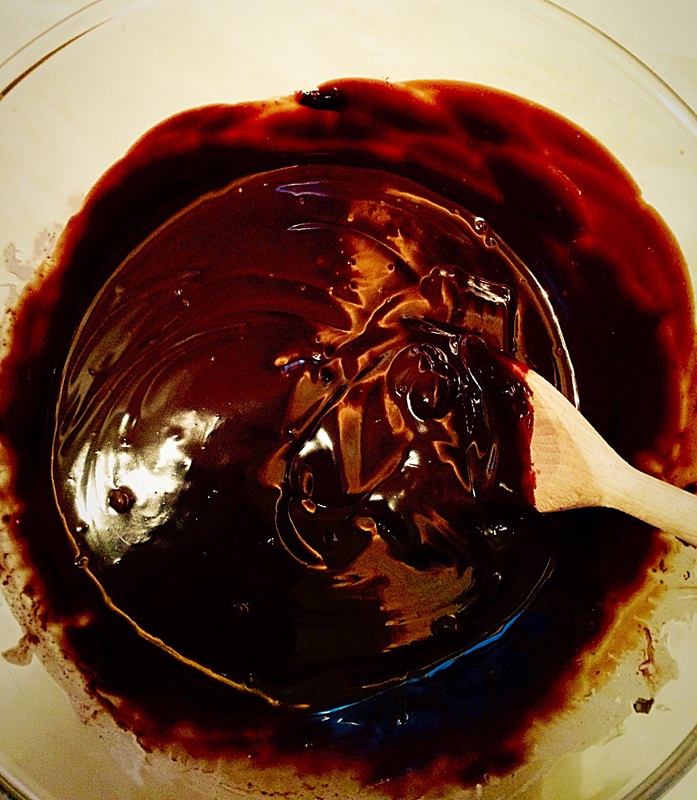 The ganache is ready to use when it is thickened but still pourable (but not runny). 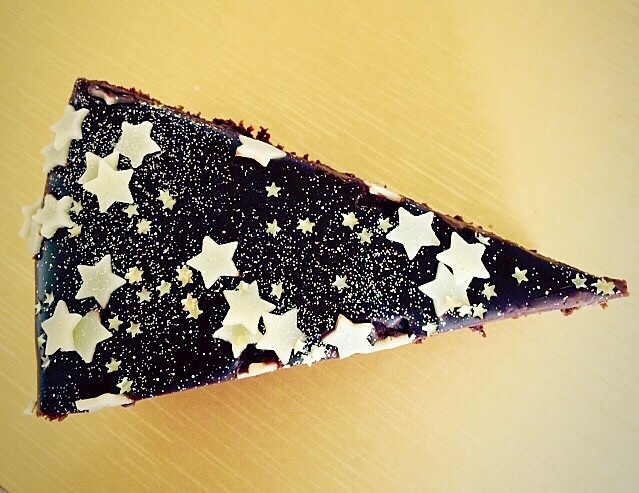 Once completely cool place the cake on a stand or board. I tapped the cake stand a couple of times against the table, to release any air bubbles trapped in the ganache. 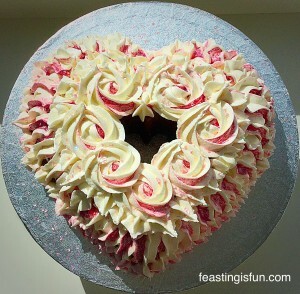 As a result, the swirled effect at the bottom of the cake was a result of my tapping! Get creative, use whatever decorations you like. The ganache is so gloriously glossy it provides the perfect canvas. 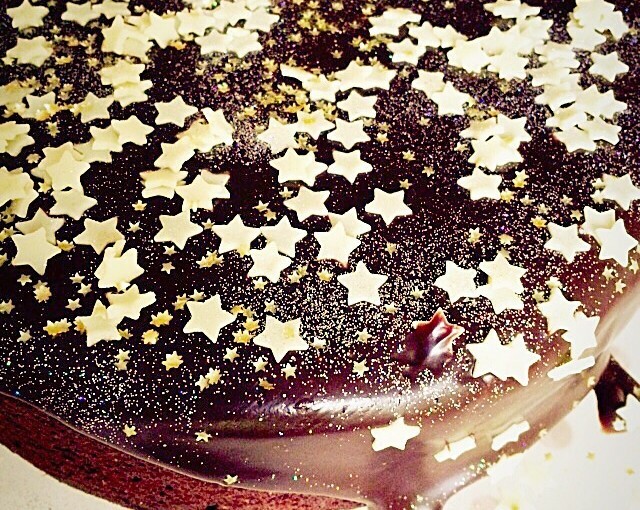 I finished the cake with a dusting of holographic edible glitter. Because more is more. Right?? 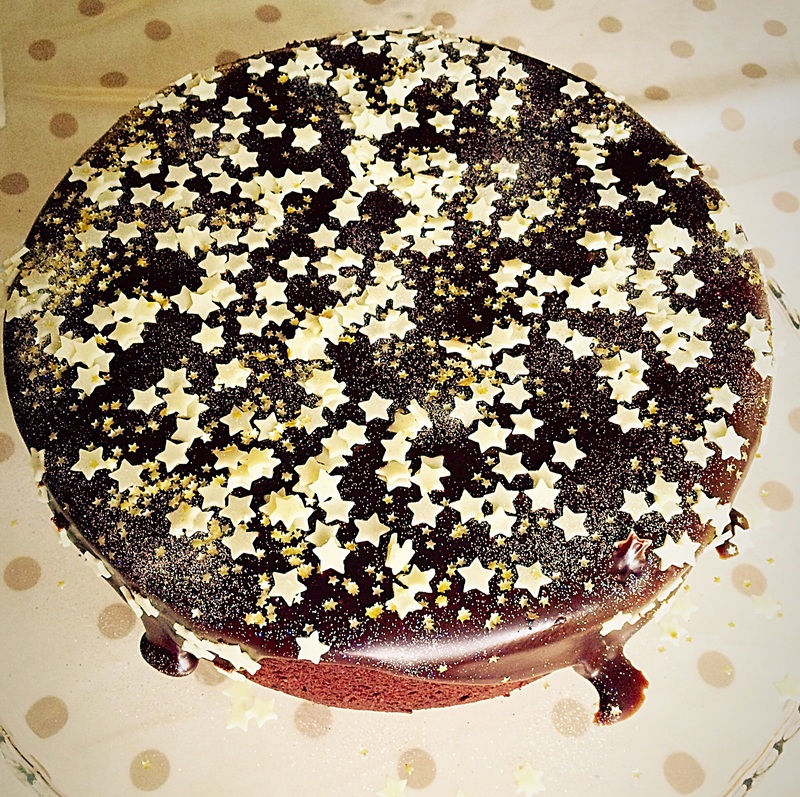 I almost called this Chocoale Sparkle Cake ‘Starry, starry night’ after one of my very favourite songs by Don McLean! 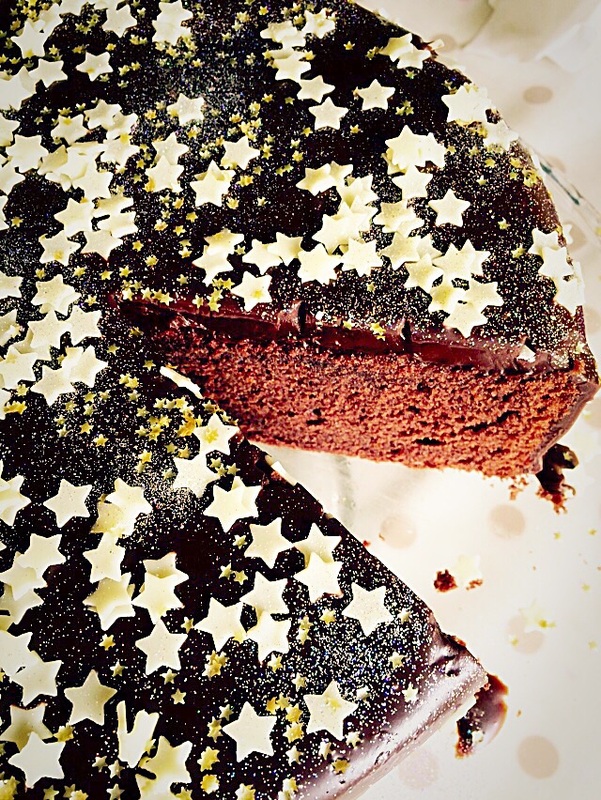 Such is the glossy, sparkly nature of this cake, as well as the moist, deep chocolate flavour, with a lingering background hit of Bailey’s, this could easily make a beautiful alternative to traditional Christmas cake. 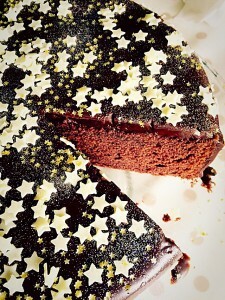 When I look at this Chocolate Sparkle Cake it just screams ‘Party’! 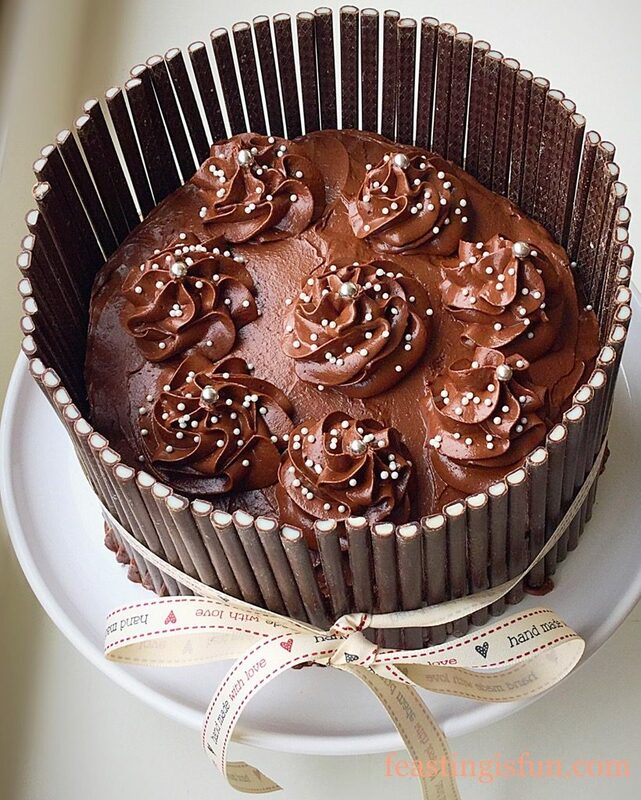 The perfect chocolate, celebration cake. Everyone loved this cake and we also celebrated the safe arrival of a friend’s baby with a slice. 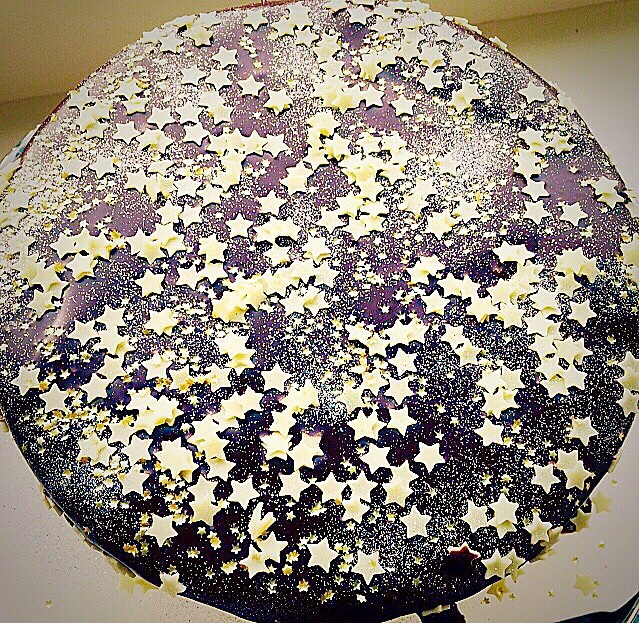 Because it is a rich cake, a little goes a long way, meaning there is more to share. 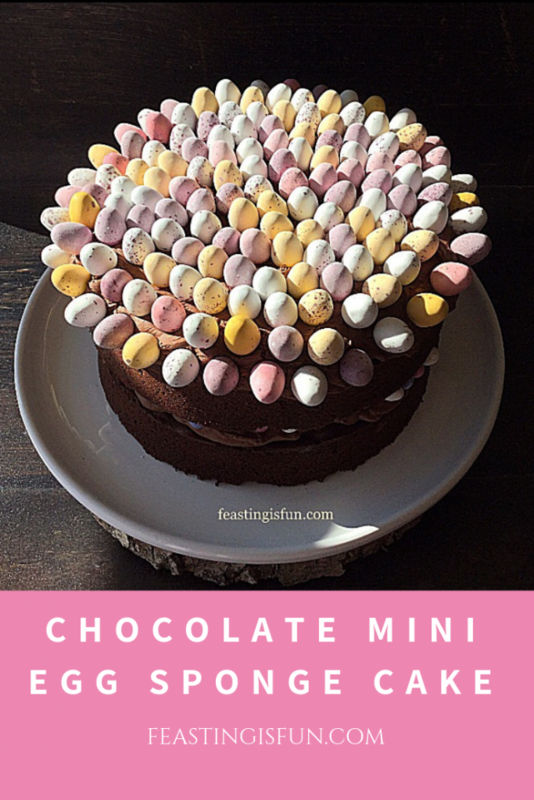 It also kept really well in a cake tin for 5 days – yes it did last that long!! I love to celebrate special occasions with a cake. Do you?